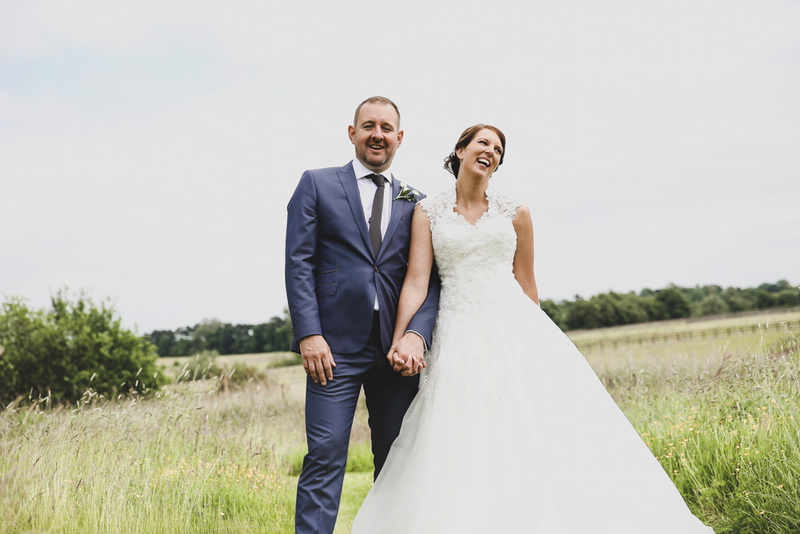 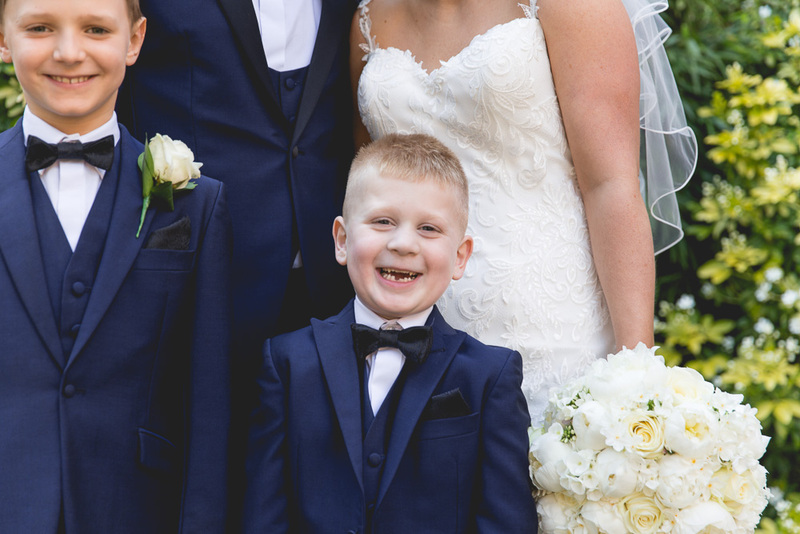 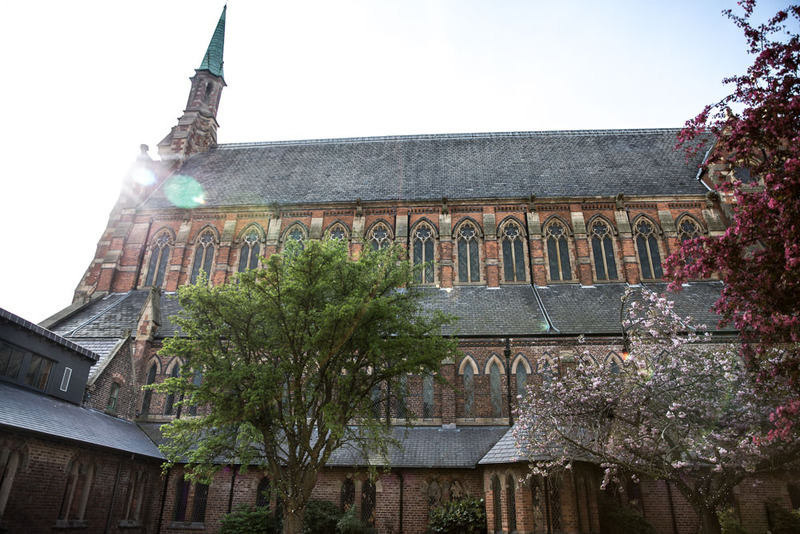 We were so excited to be photographing Rachael + Dene’s The Monastery Wedding in April 2017, we find April surprises us with it’s beautiful warm weather and has for the last few years so it’s become a popular month to marry. 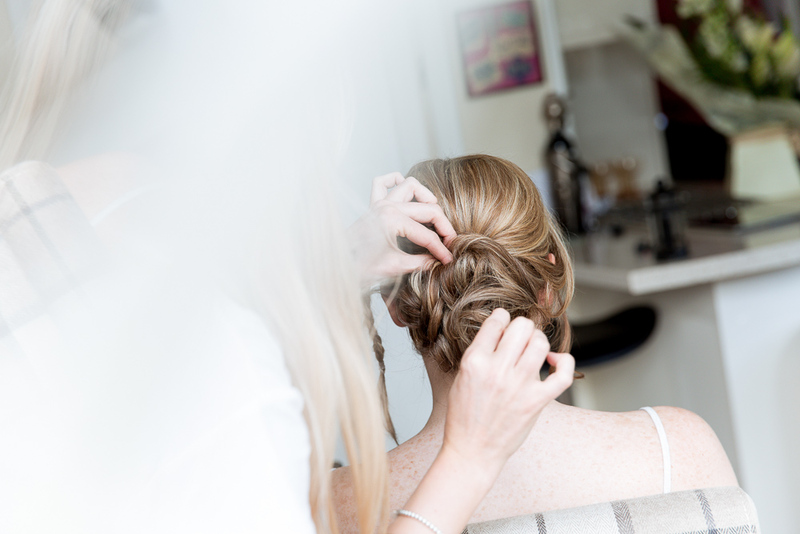 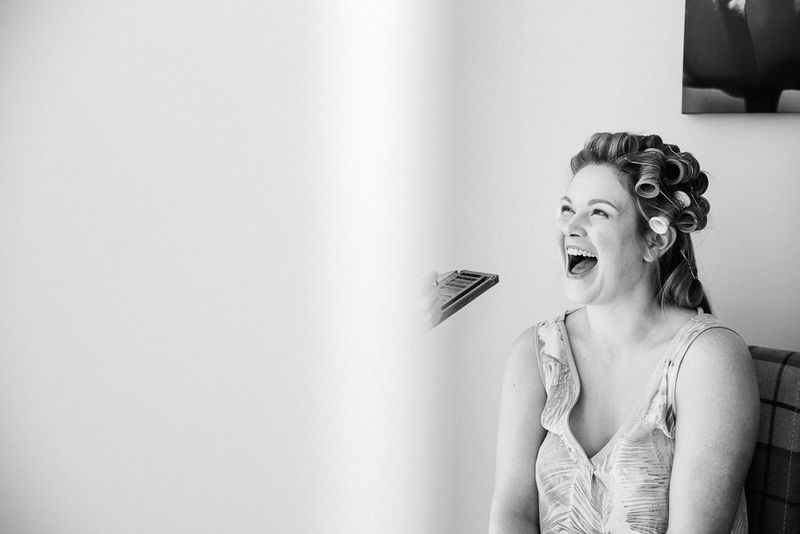 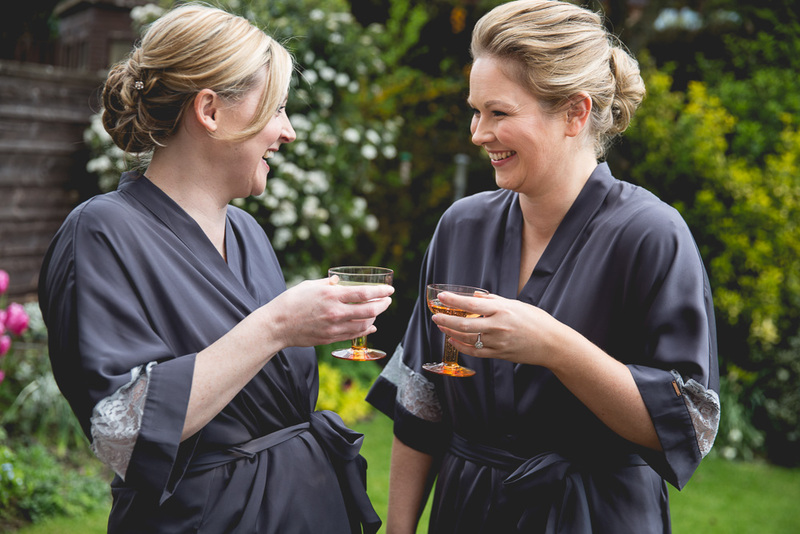 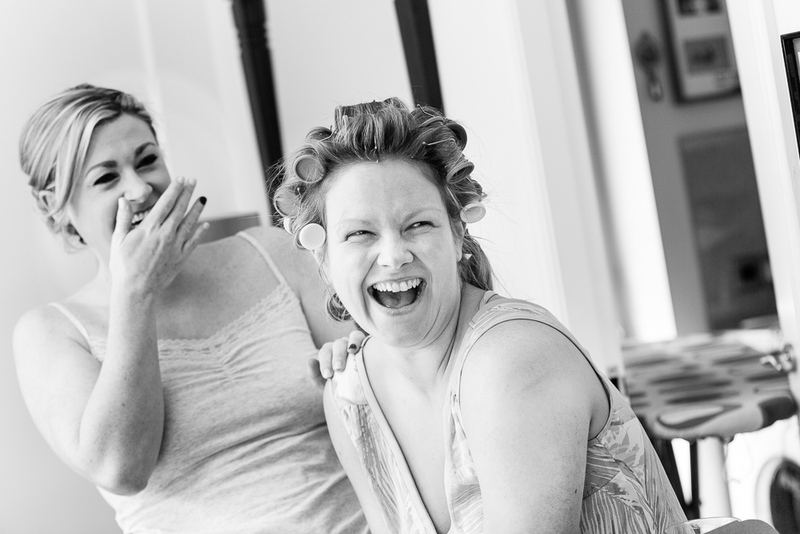 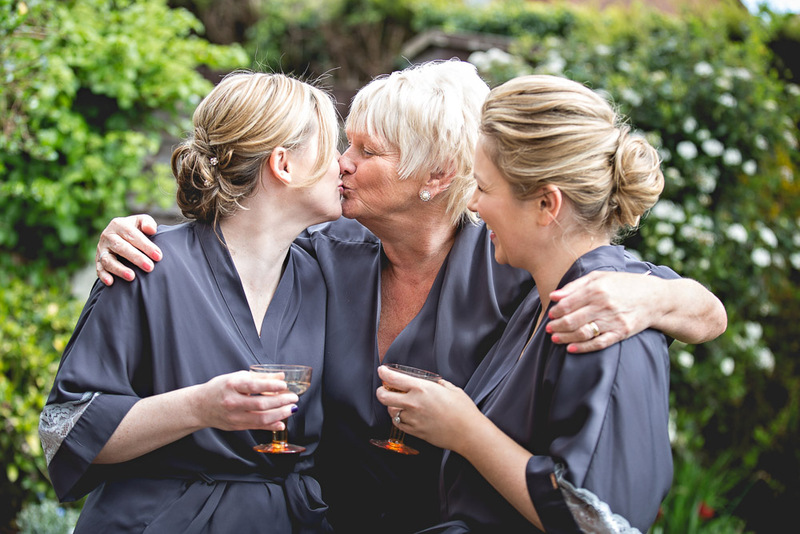 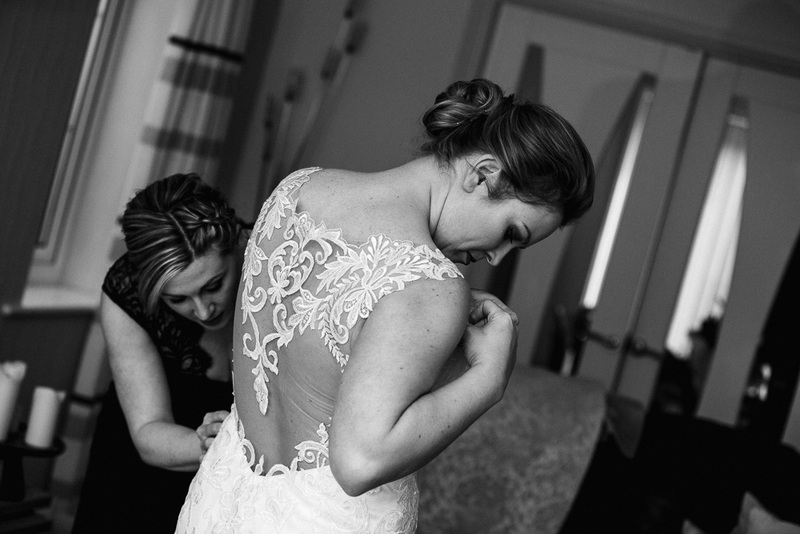 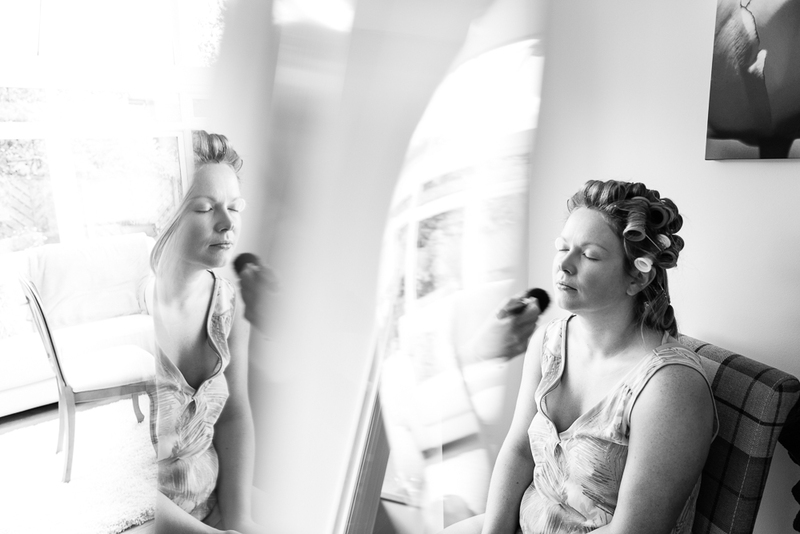 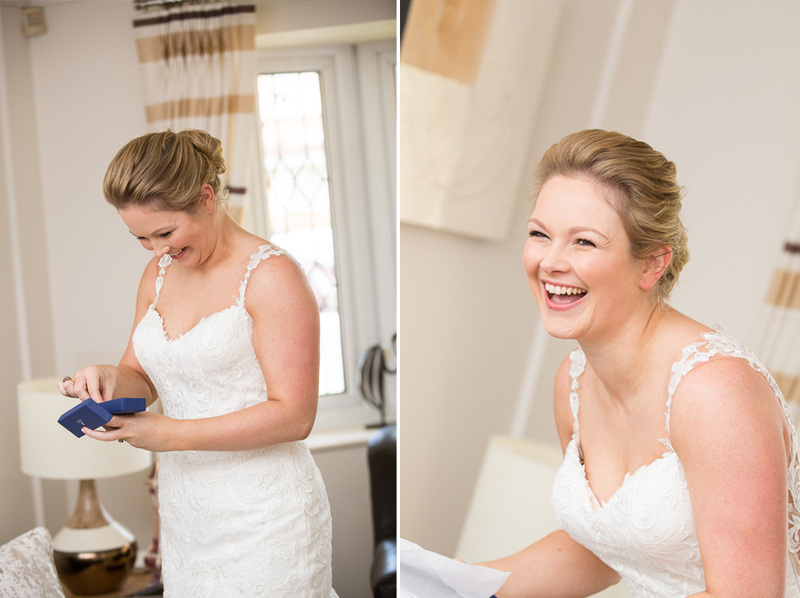 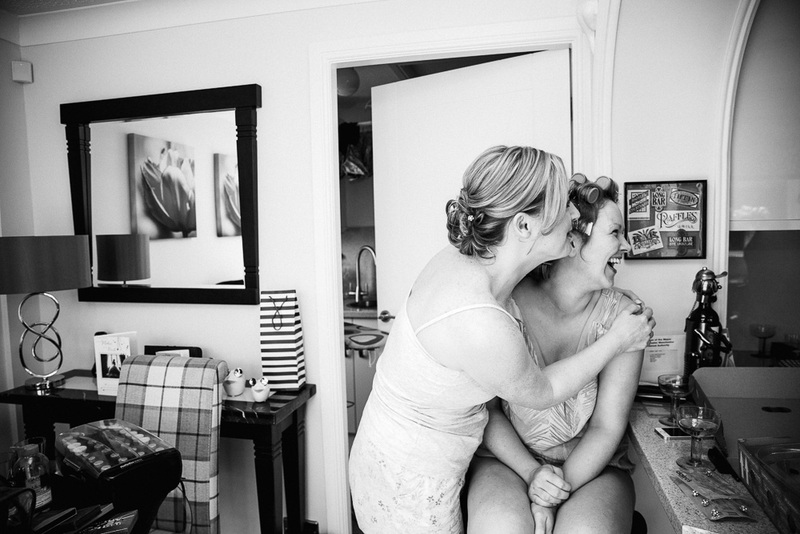 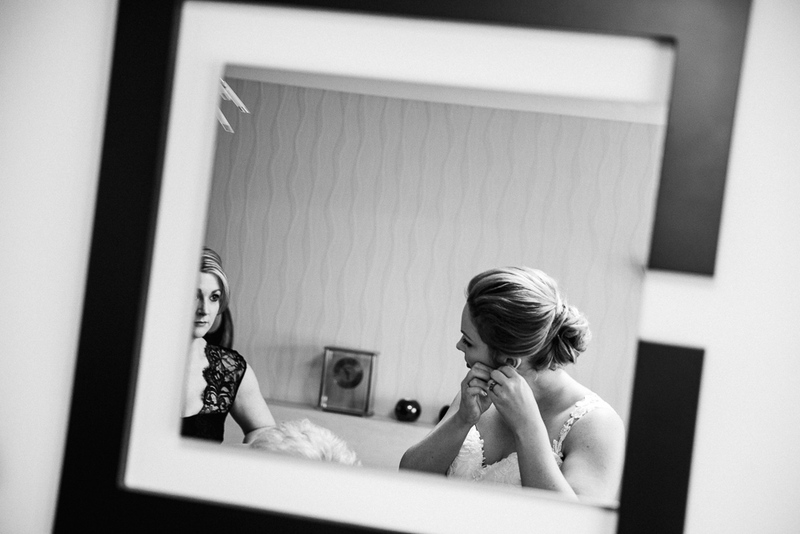 The day started with a relaxed morning of Bridal Preparations at Rachael’s mum’s house, the champaign was flowing and everyone was having a good giggle Louise Hall did a fantastic job of Rachael & Laura’s hair & makeup. 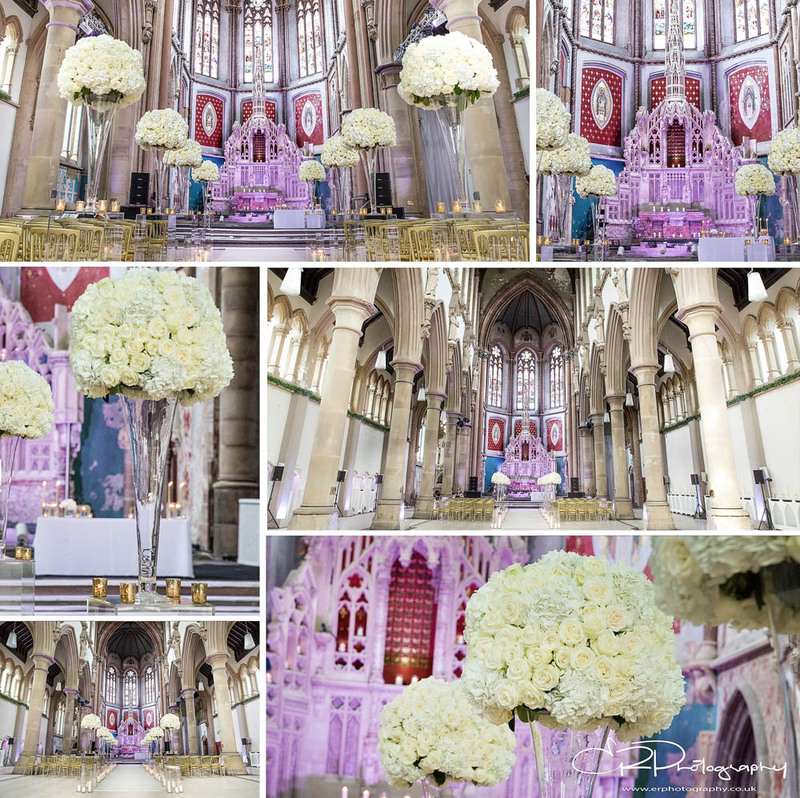 Rachael hired cars from Your Wedding Chauffeur and arrived in style at The Monastery, she was immediately wowed by the new annex that was finished just in time for their big day, the placed looked magical and the flowers by Jenny Holmes which framed the aisle were exactly what Rachael had imagined. 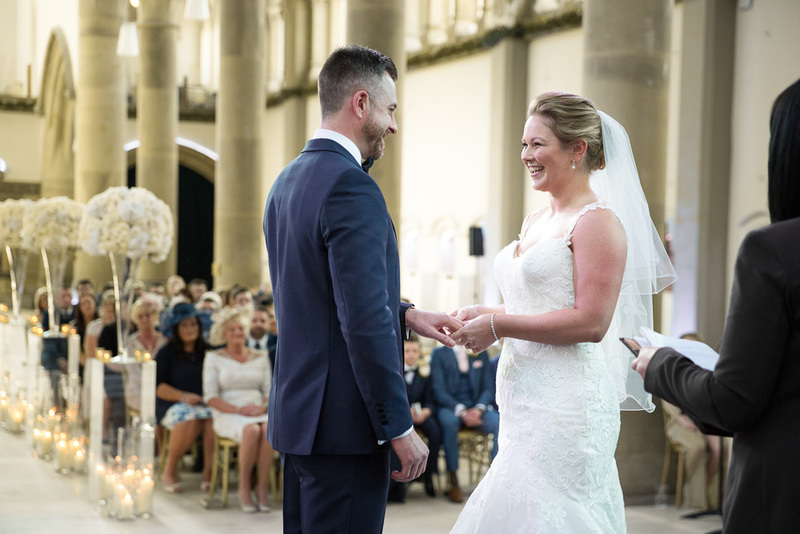 Before the ceremony started guests were entertained by the soothing sounds of String Infusion a wonderful Quartet of modern music in a classical style, the perfect style to compliment The Monastery. 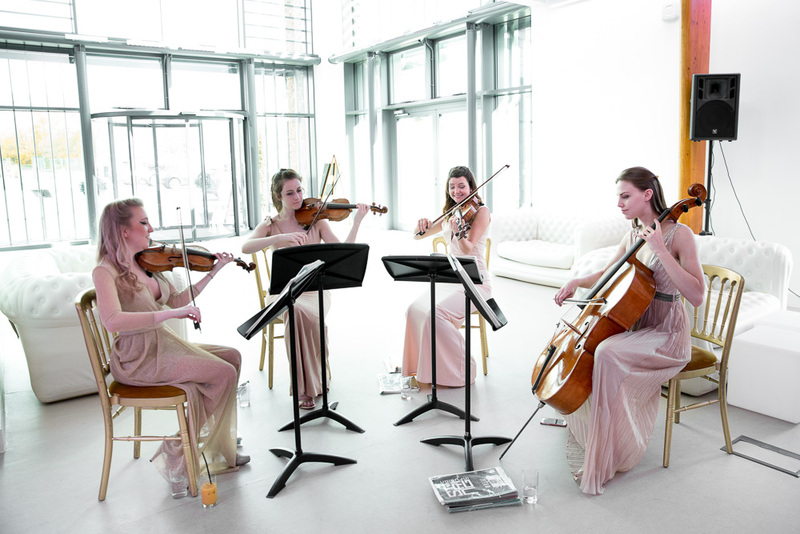 String Infusion also played during the champaign drinks reception whilst Rachael + Dene had photos in the courtyard with family and friends. 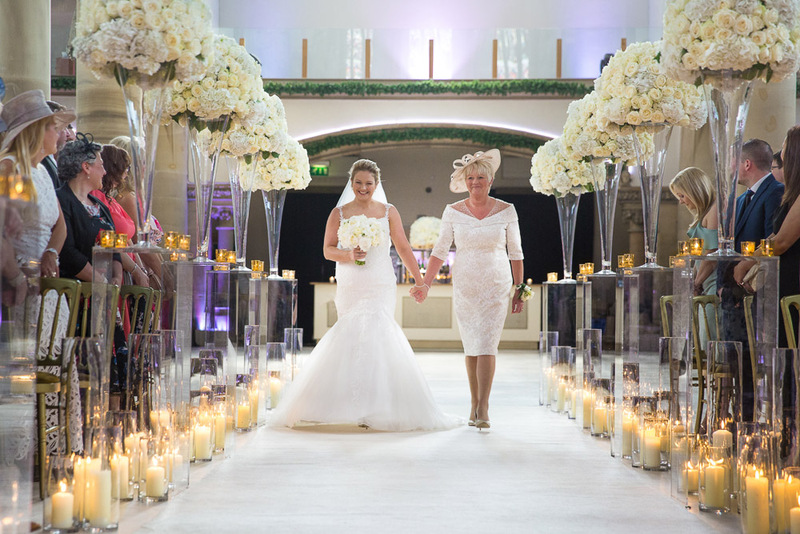 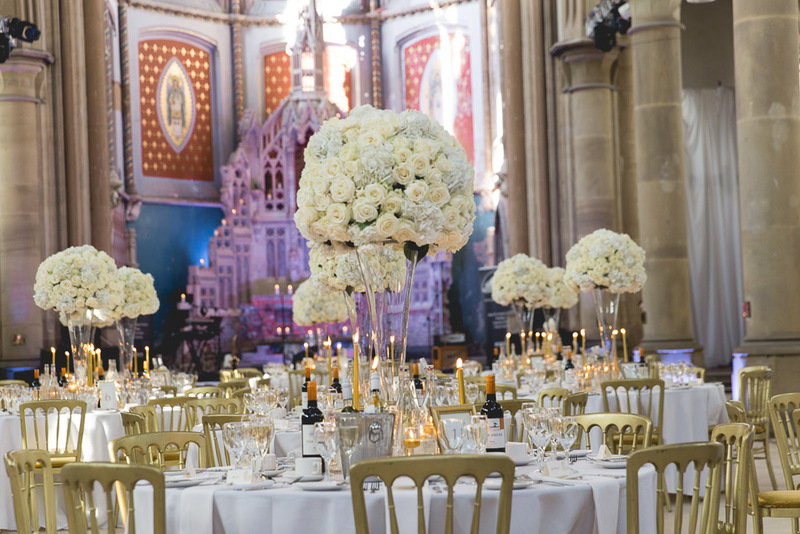 The wedding breakfast was held in the main hall and decorated by Jenny Holmes’s team, you really do need something special to go with this space and the flowers looked gorgeous. 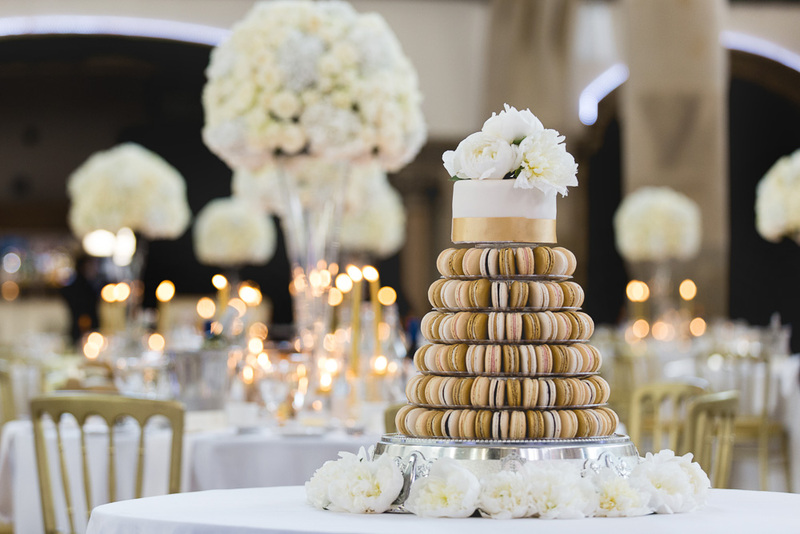 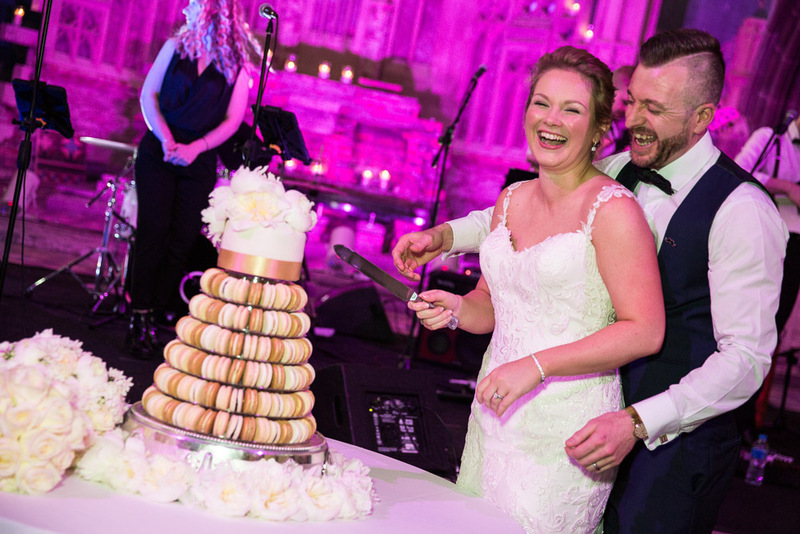 The cake was very impressive too, full of macaroons in natural colours to compliment the theme The English Rose Bakery pulled it out the bag with that yummy creation. 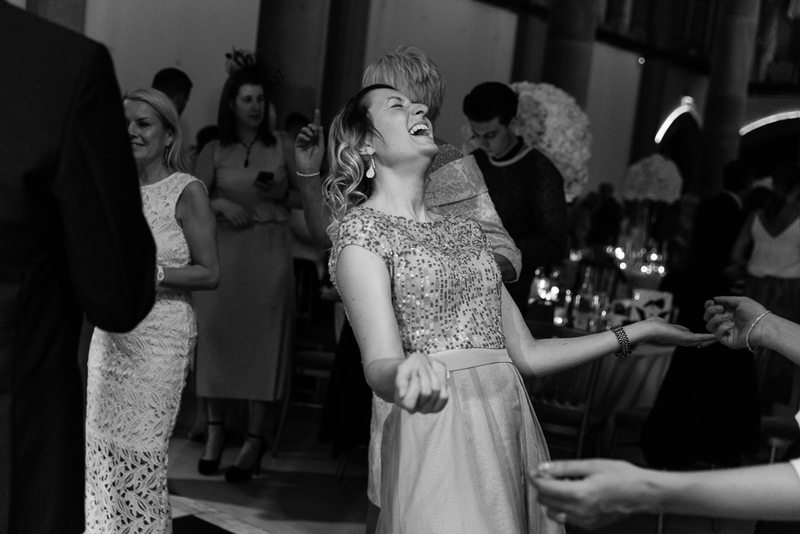 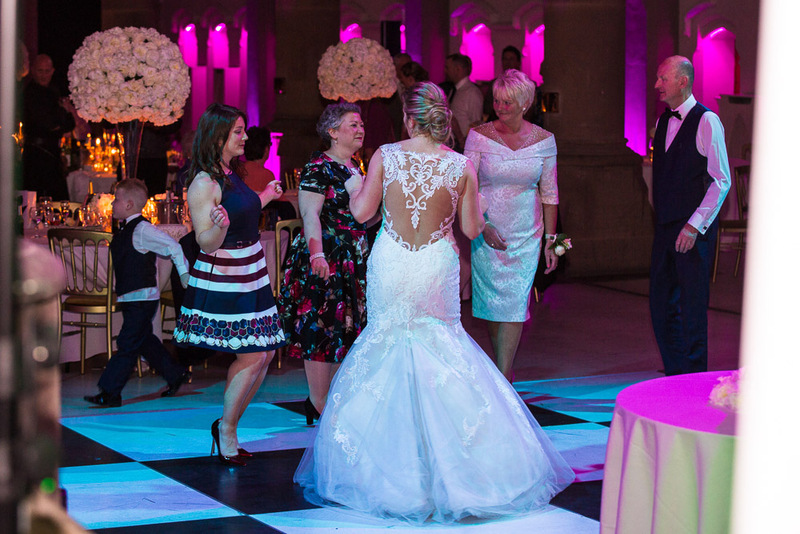 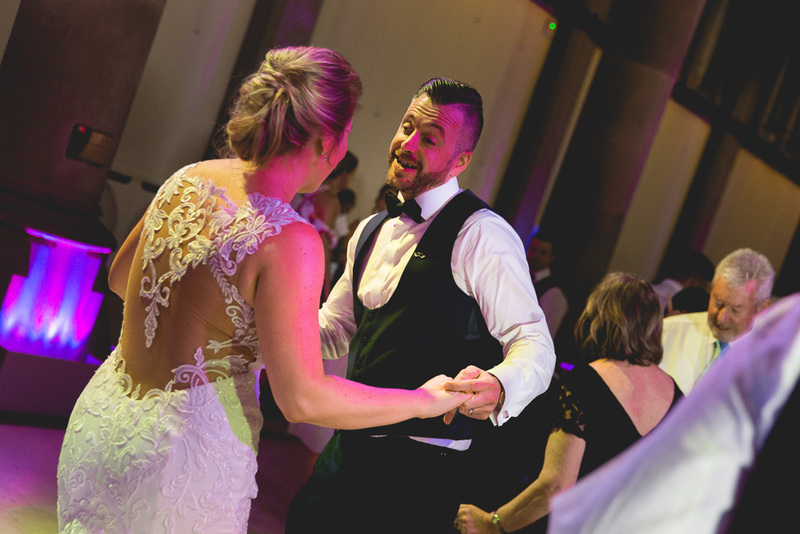 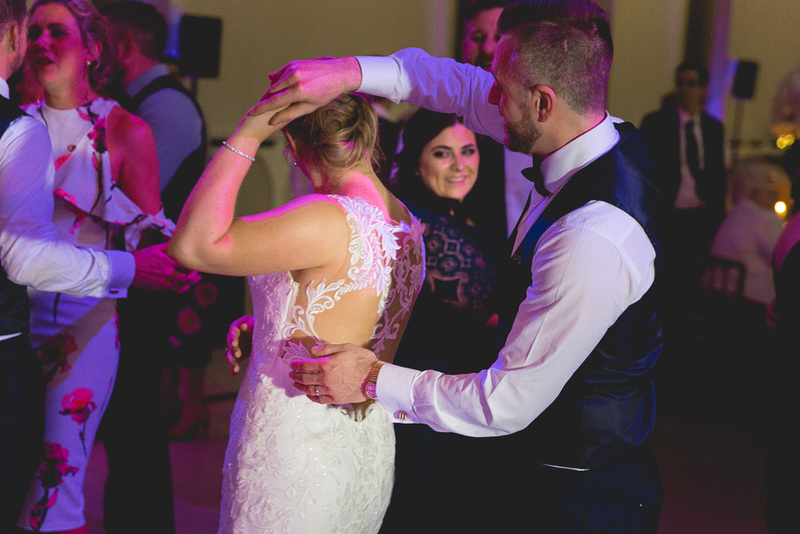 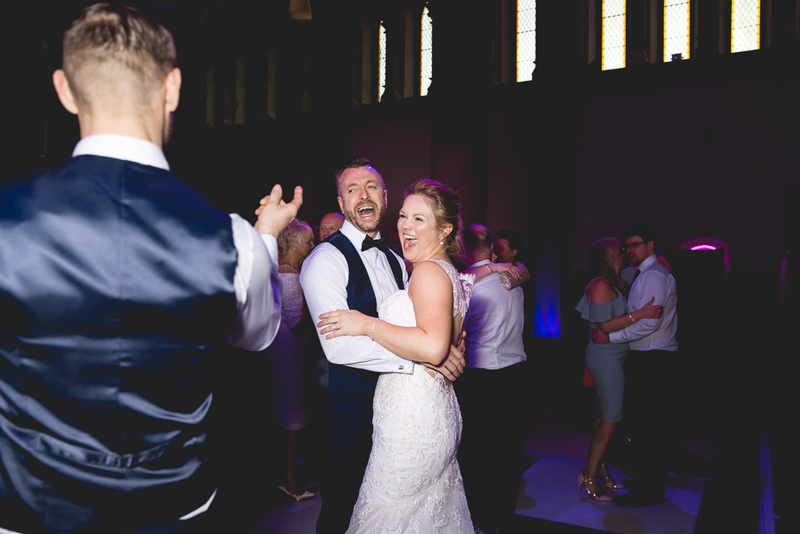 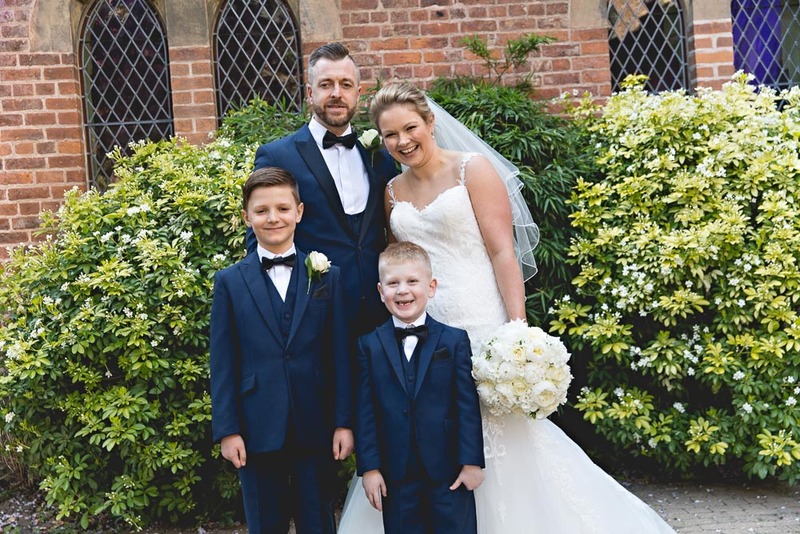 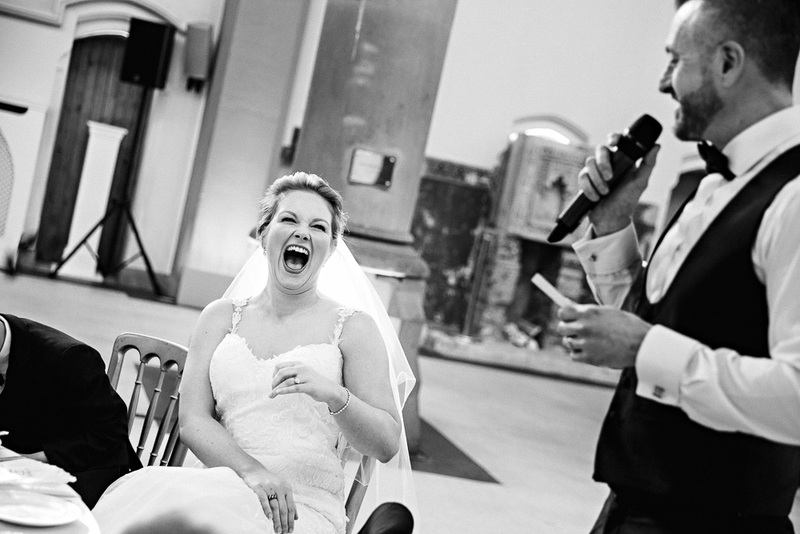 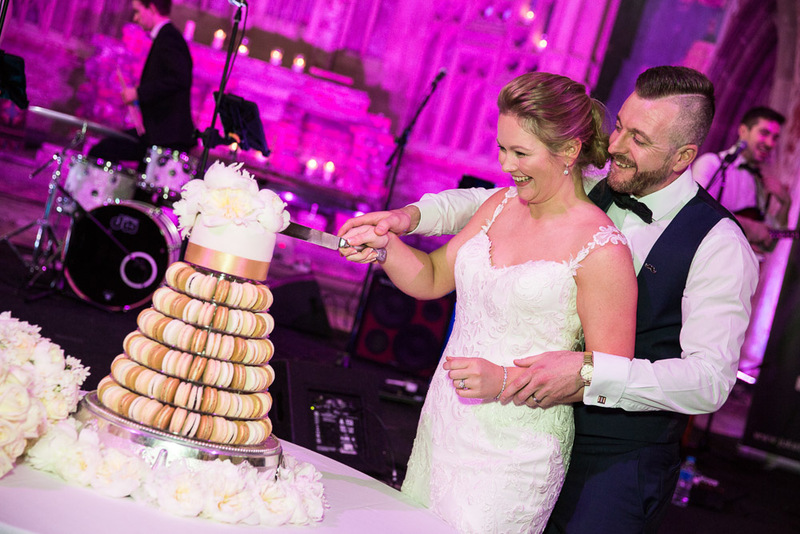 After the speeches it was ready for THE PARTY where Rachael + Dene were super excited to hear Juke Box Band play live as they had chosen a 1st dance which the band had rehearsed especially for them, they didn’t disappoint it was fantastic. 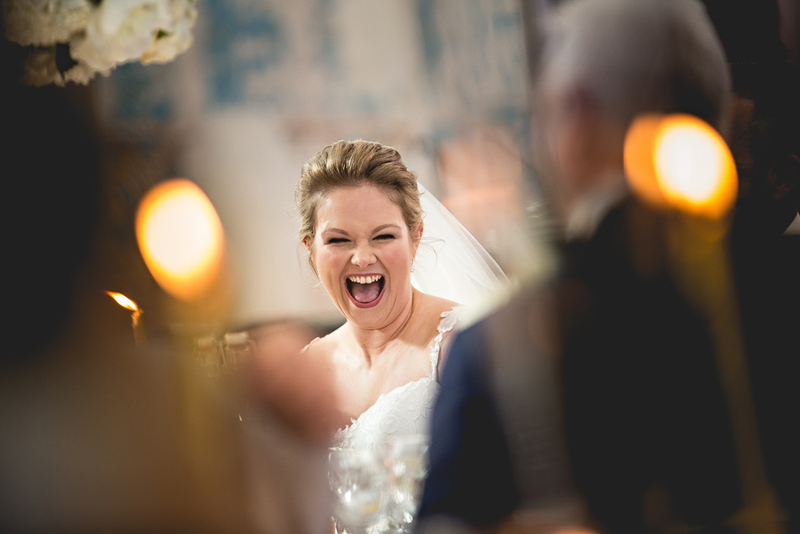 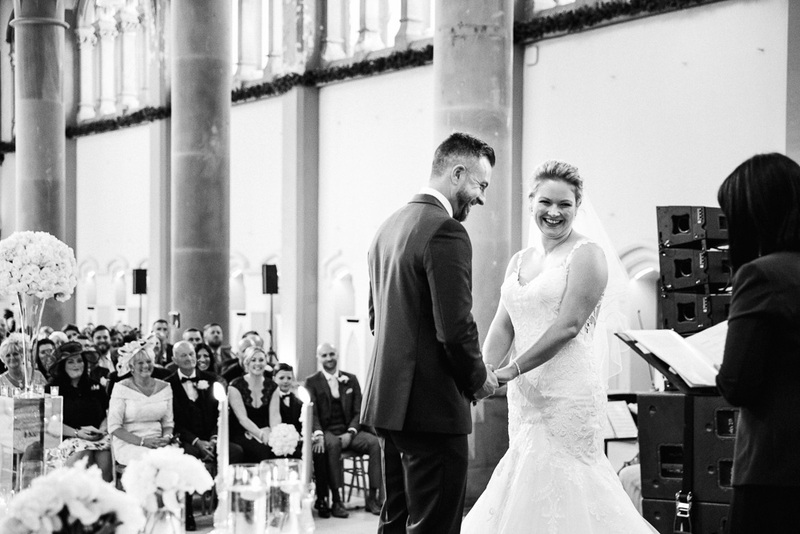 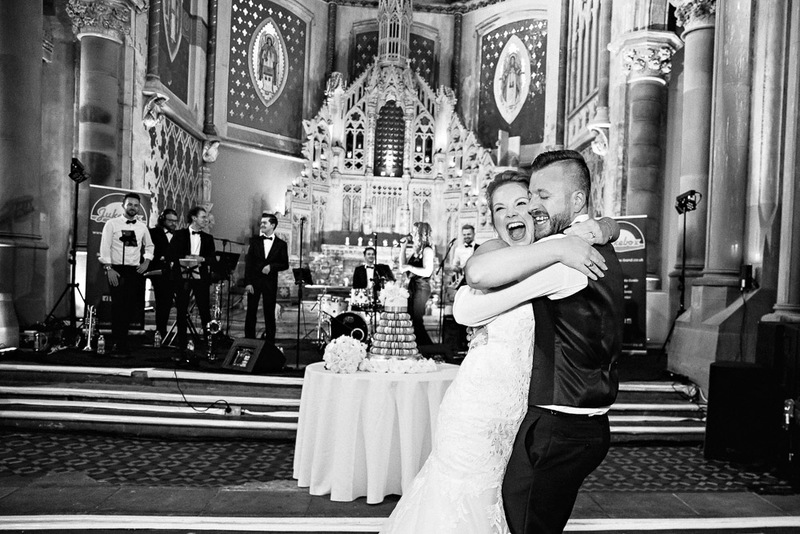 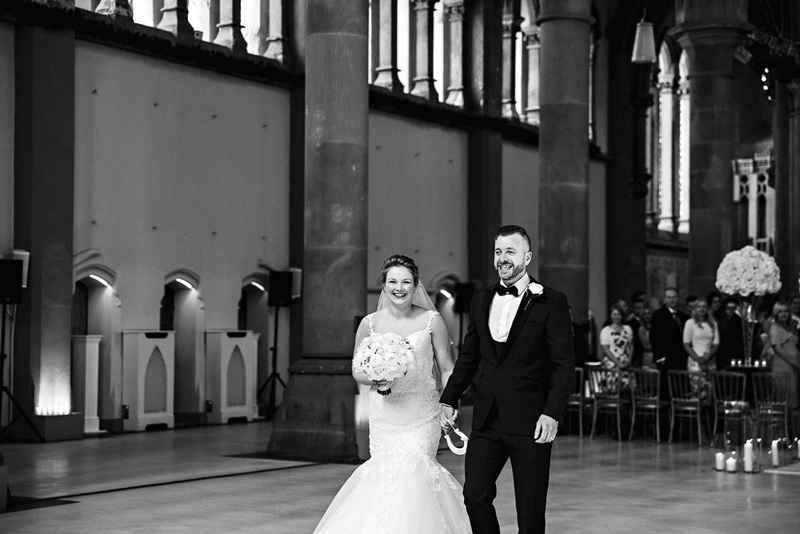 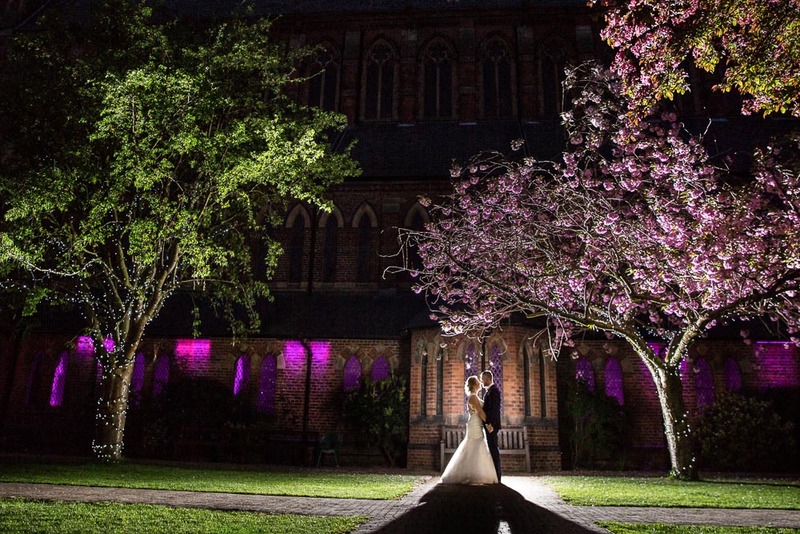 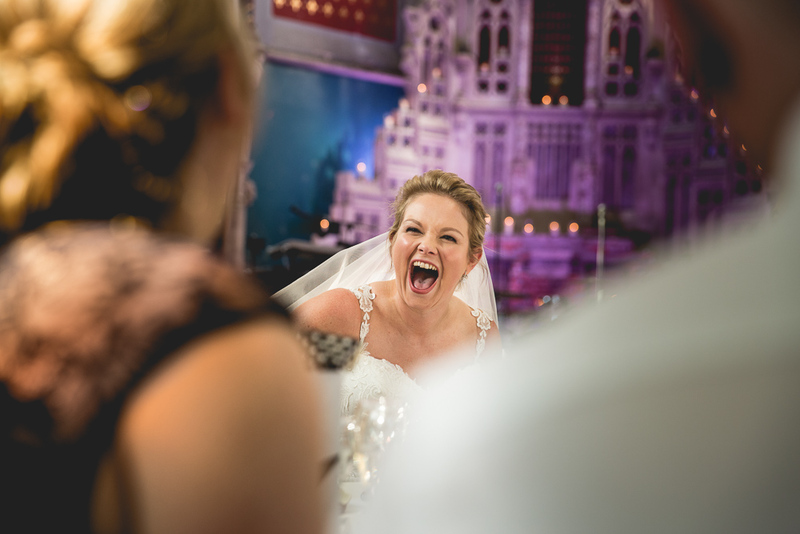 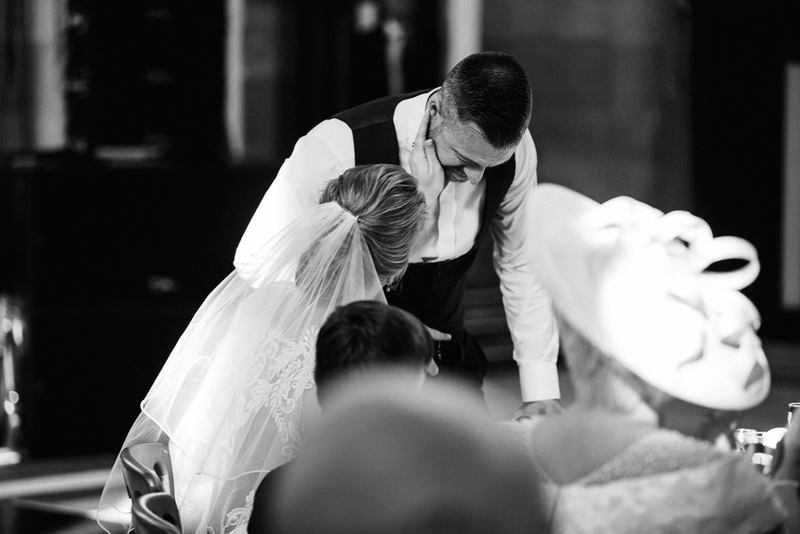 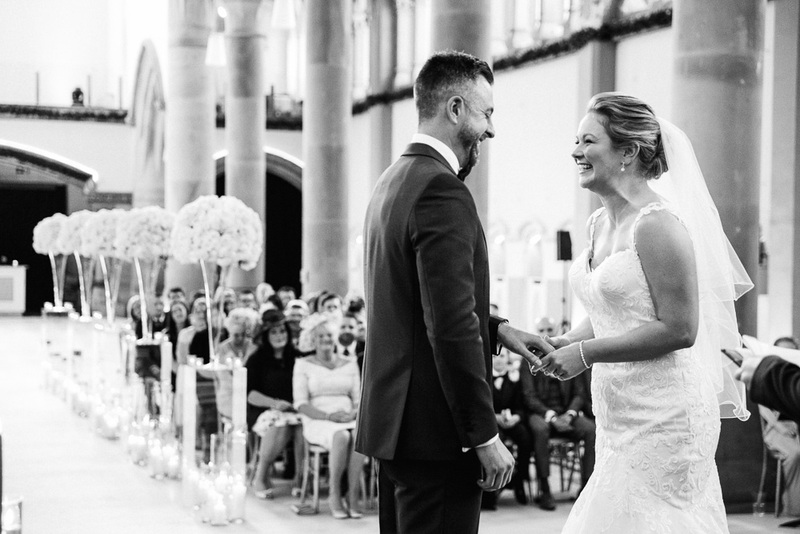 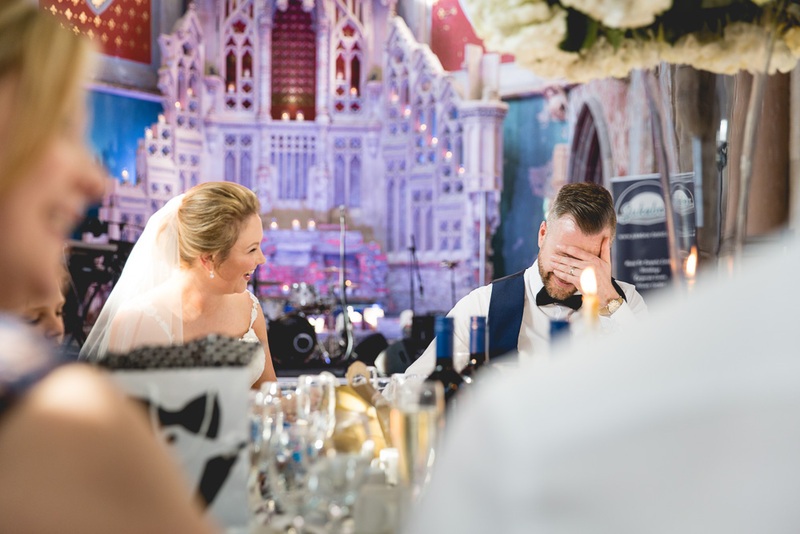 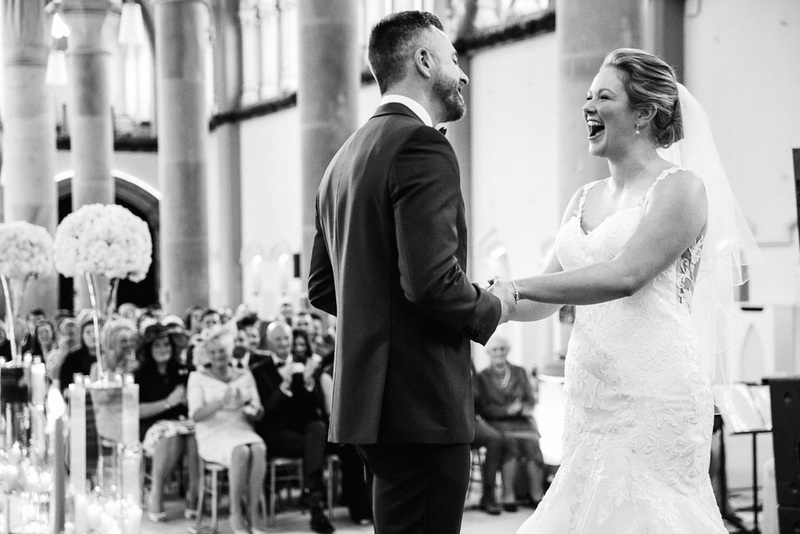 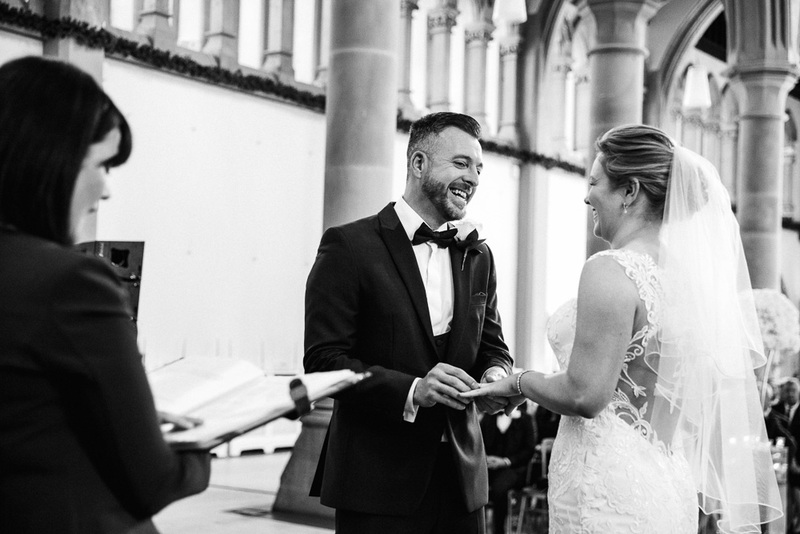 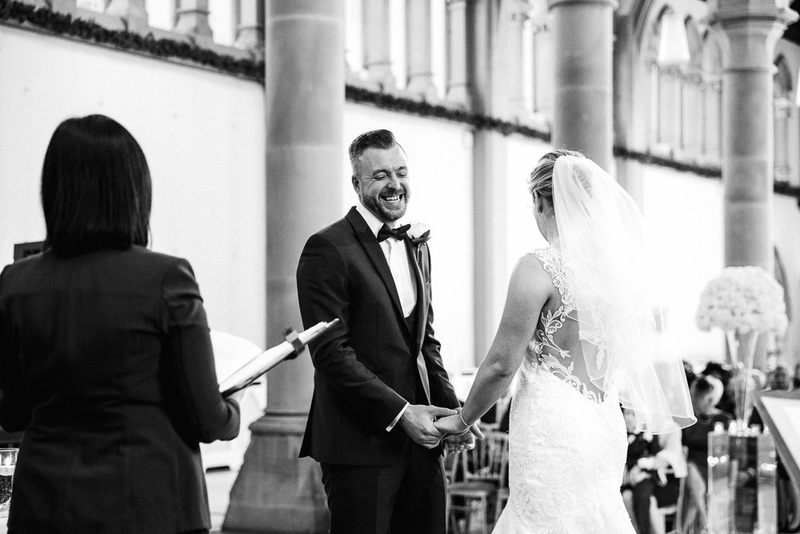 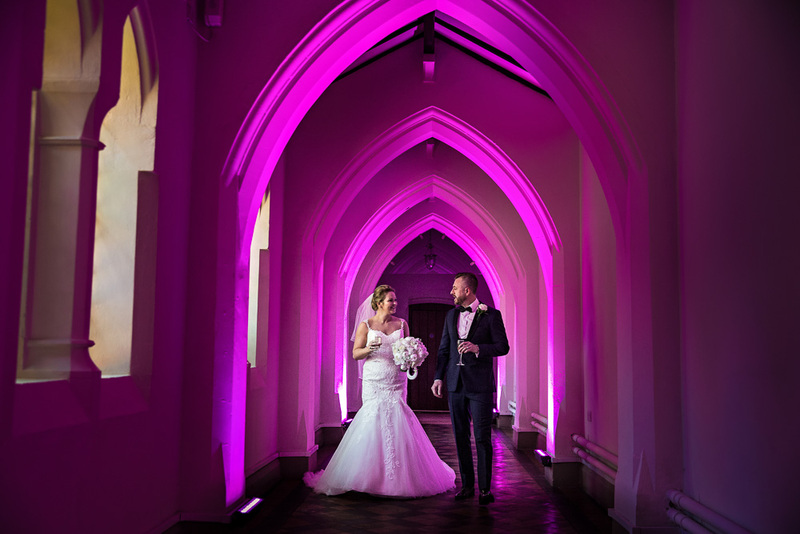 After a few dancefloor moments it was time for us to pack up and ship out but not before we say a massive thank you to The Monastery and all the amazing suppliers that made Rachael + Dene’s day so special. 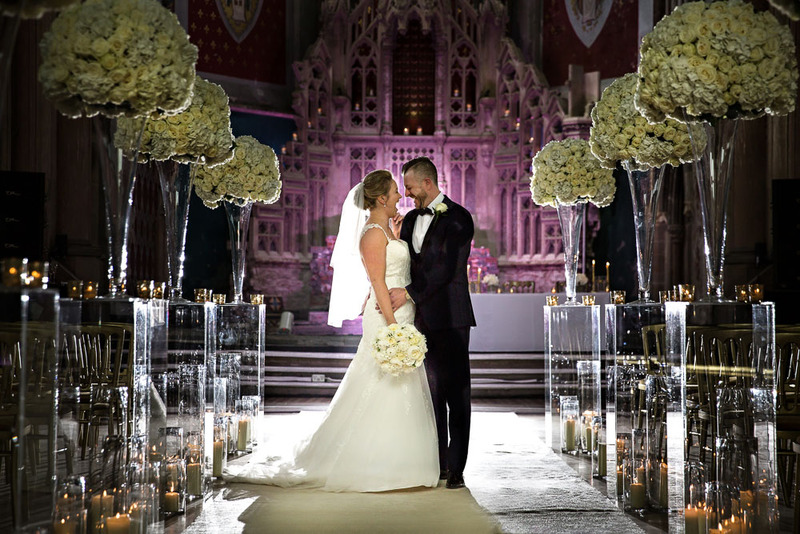 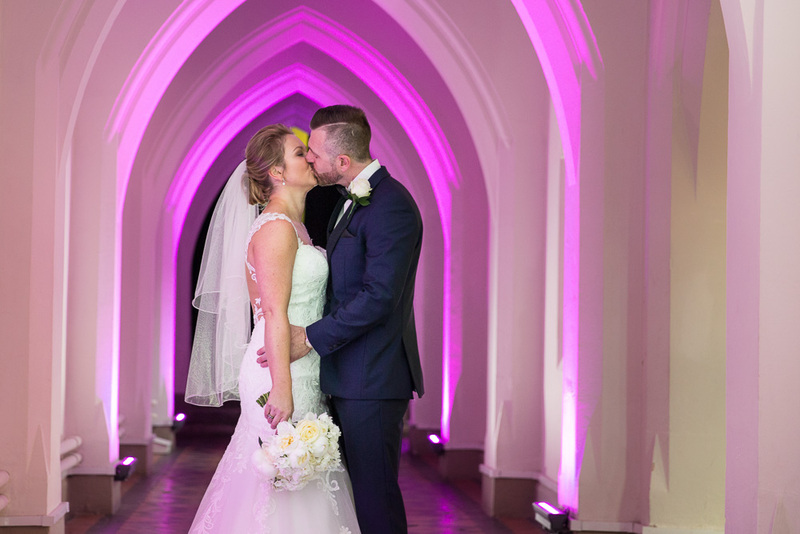 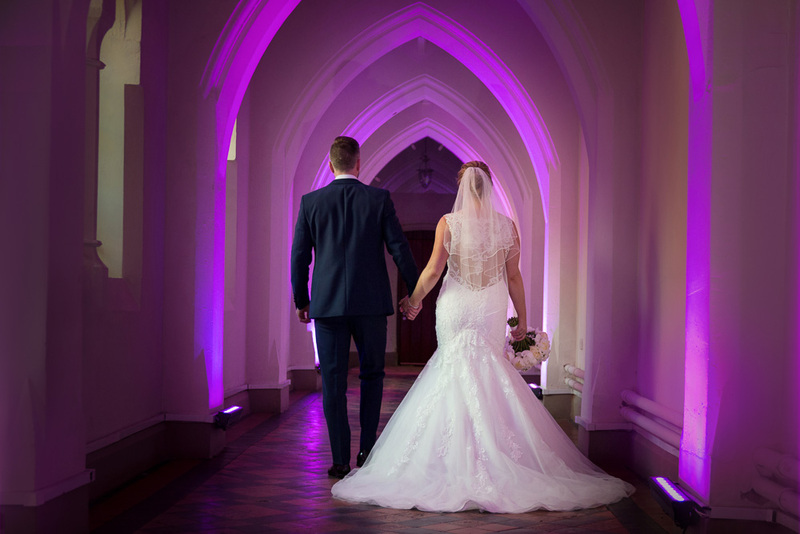 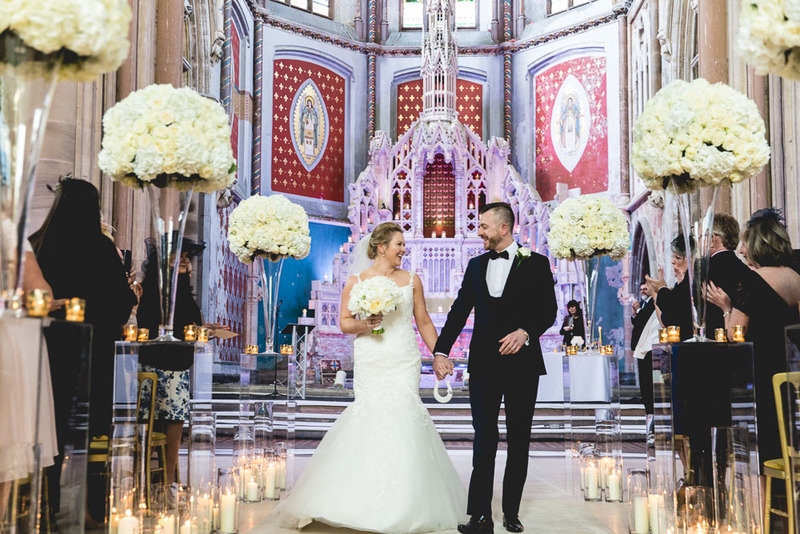 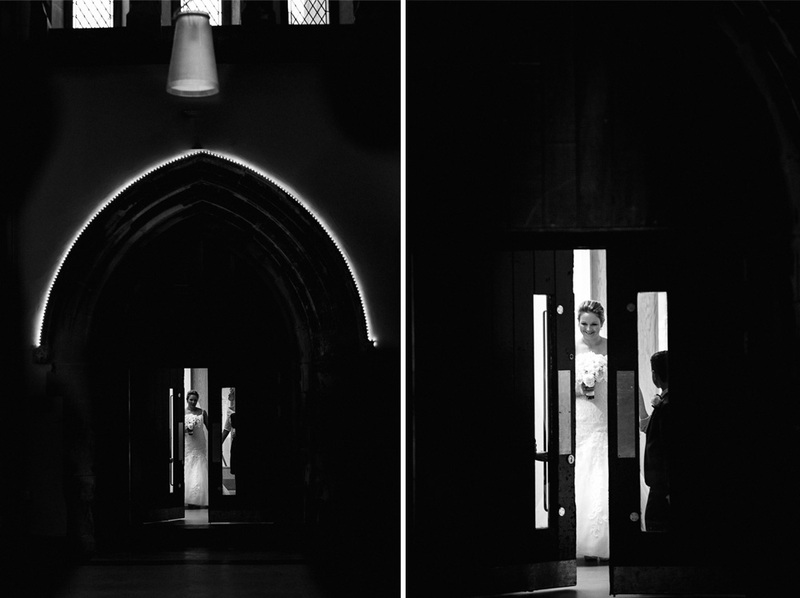 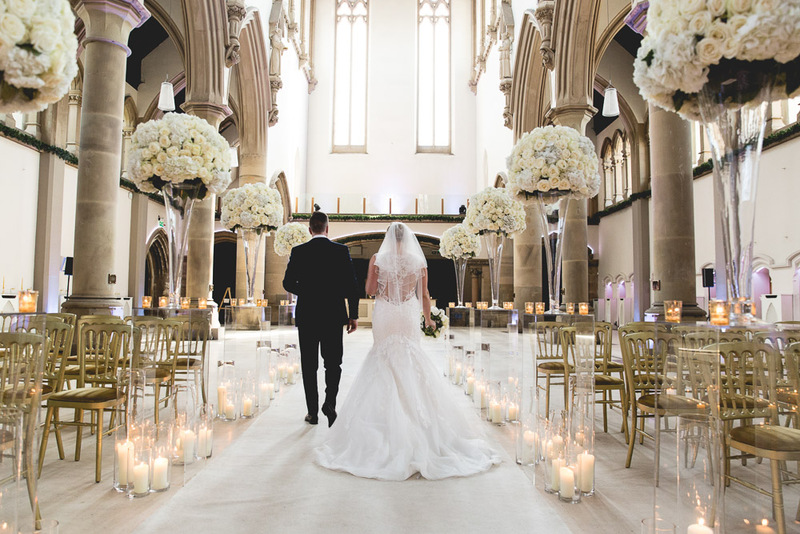 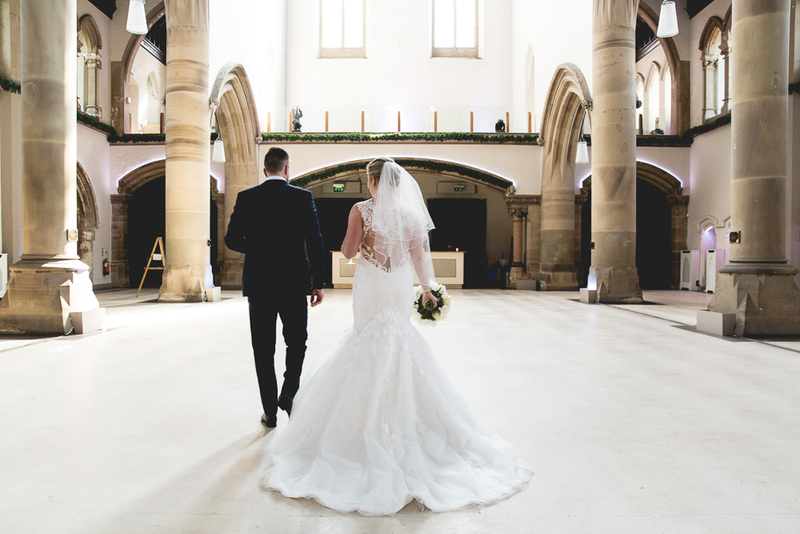 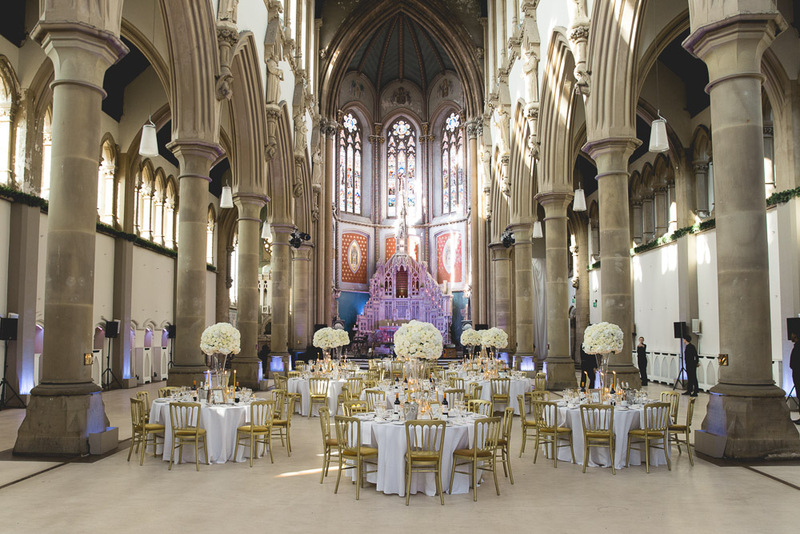 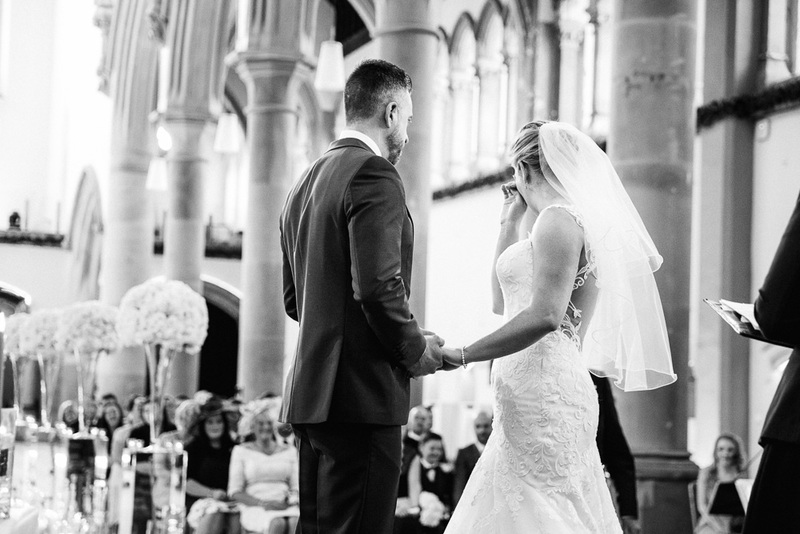 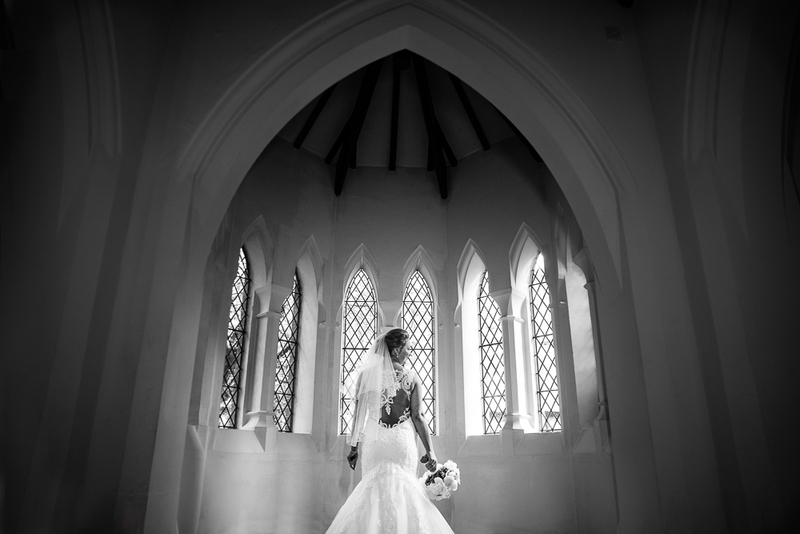 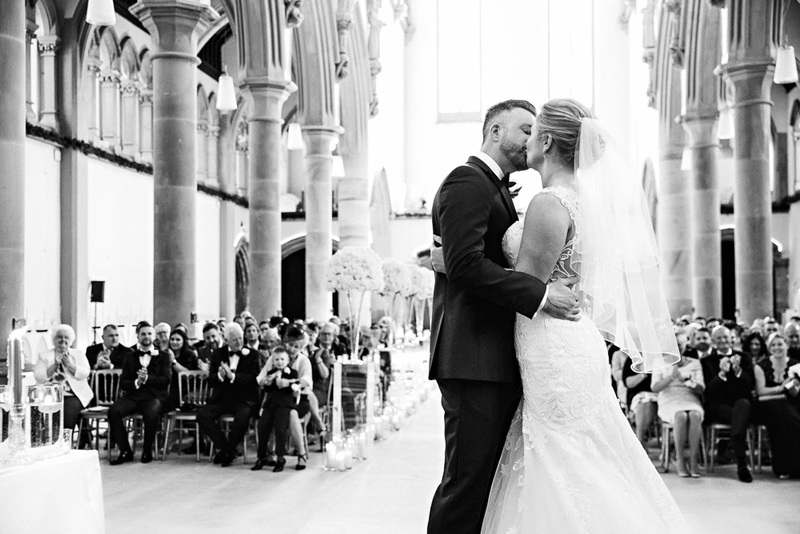 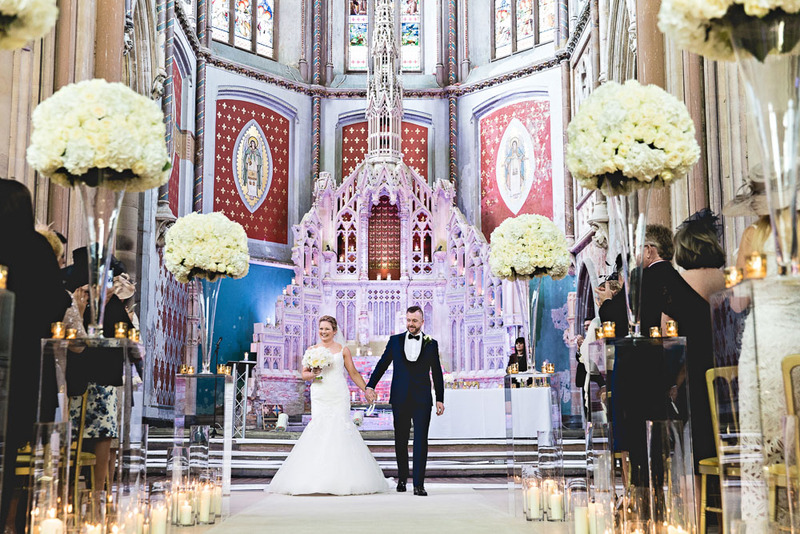 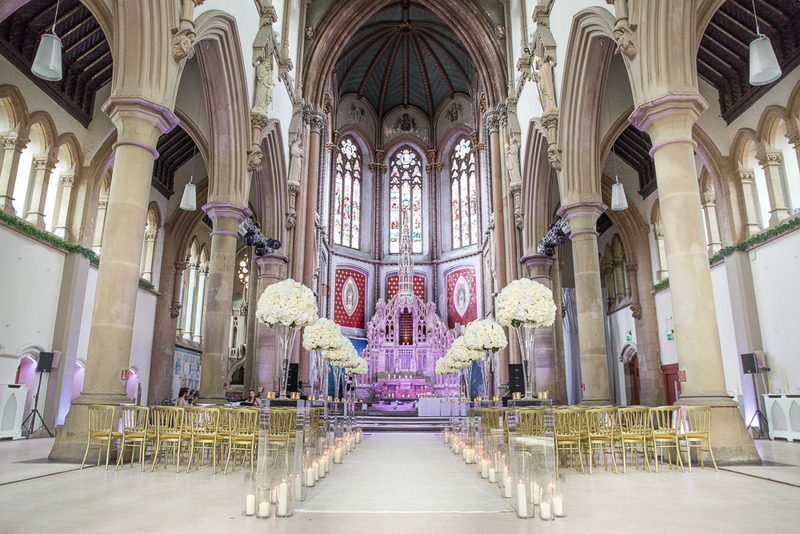 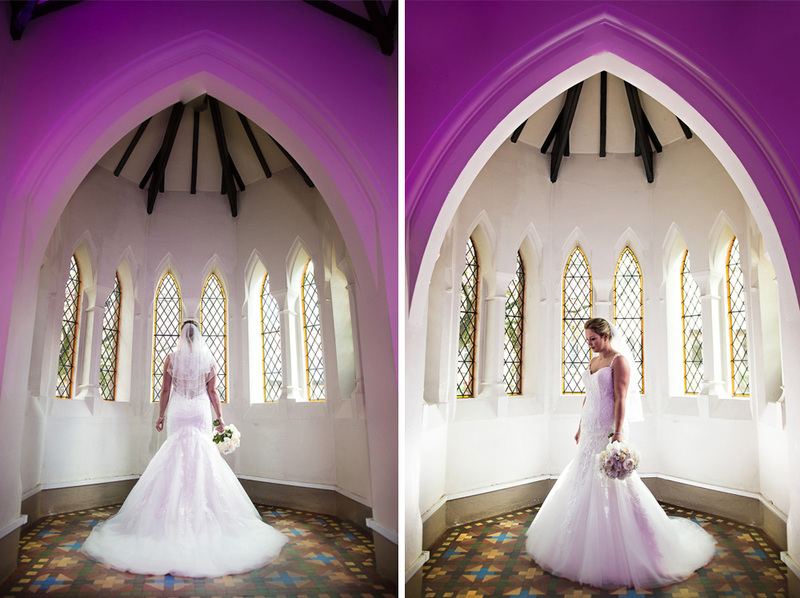 What we loved about the Monastery is it’s architecture, it’s undoubtably one of the most wow venues we’ve shot at and ideal for those couples who want the wow factor to their wedding. 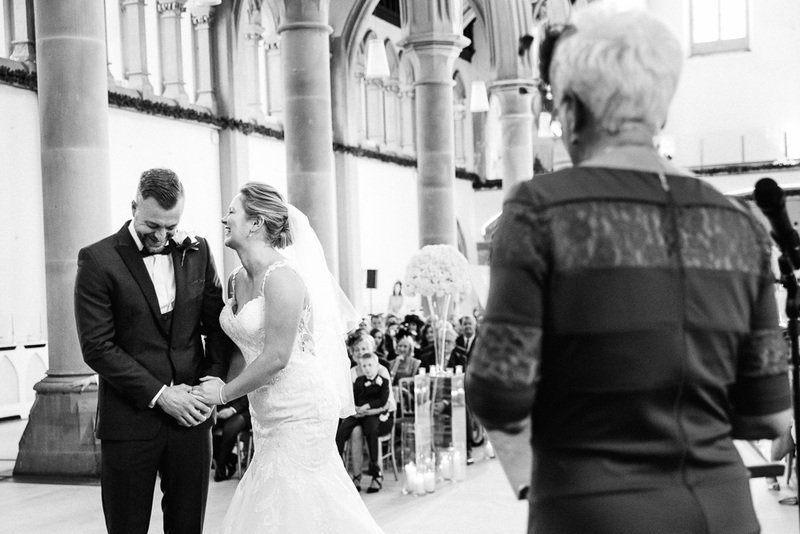 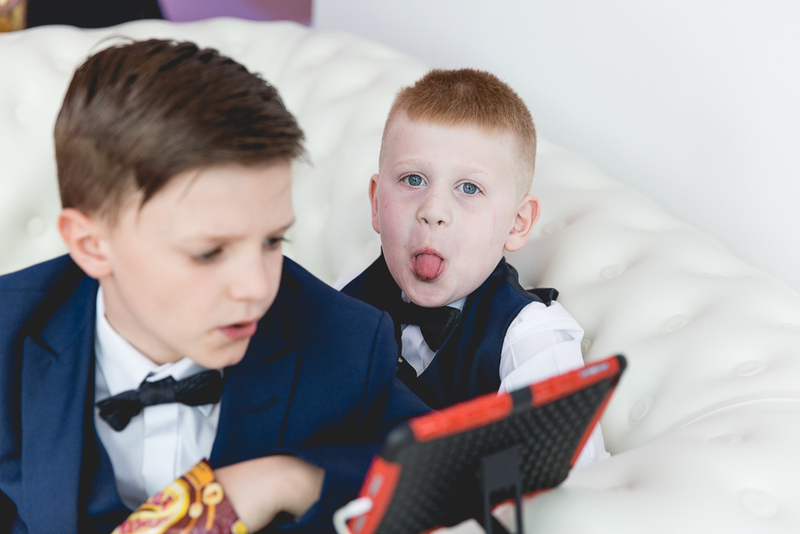 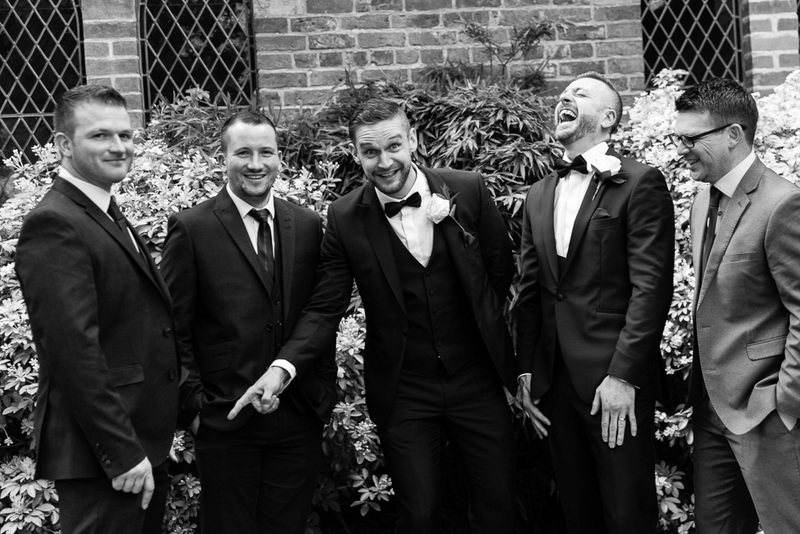 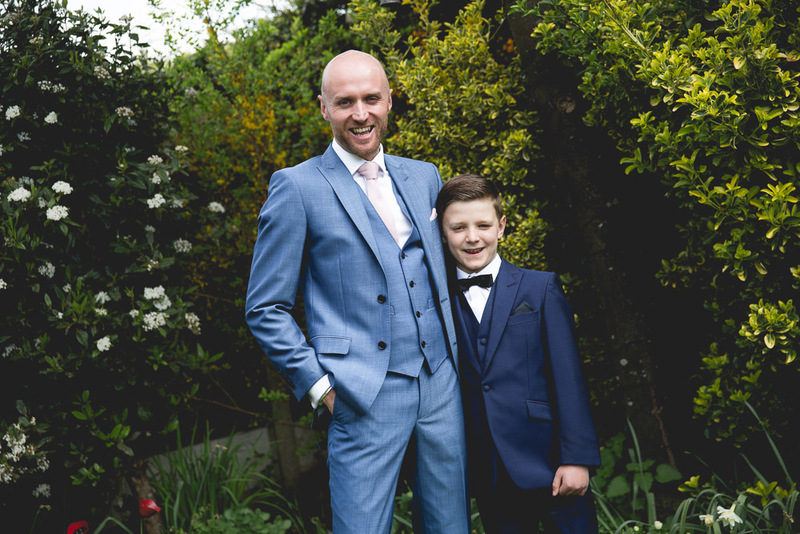 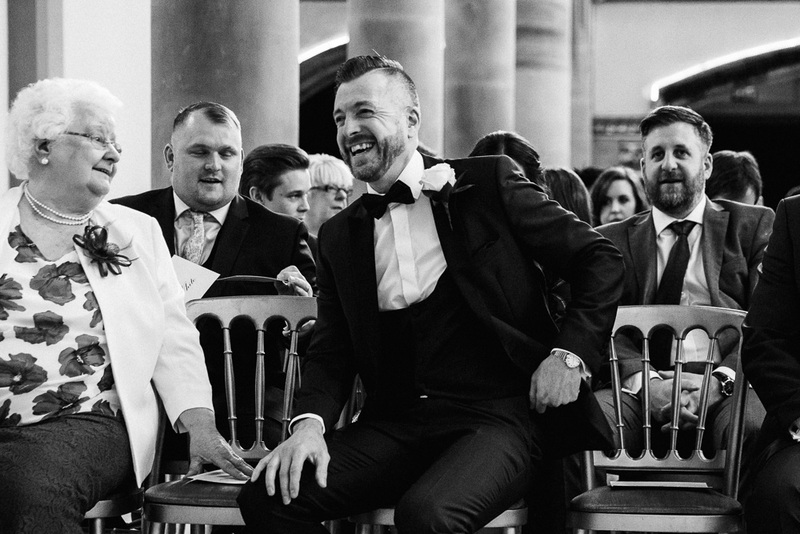 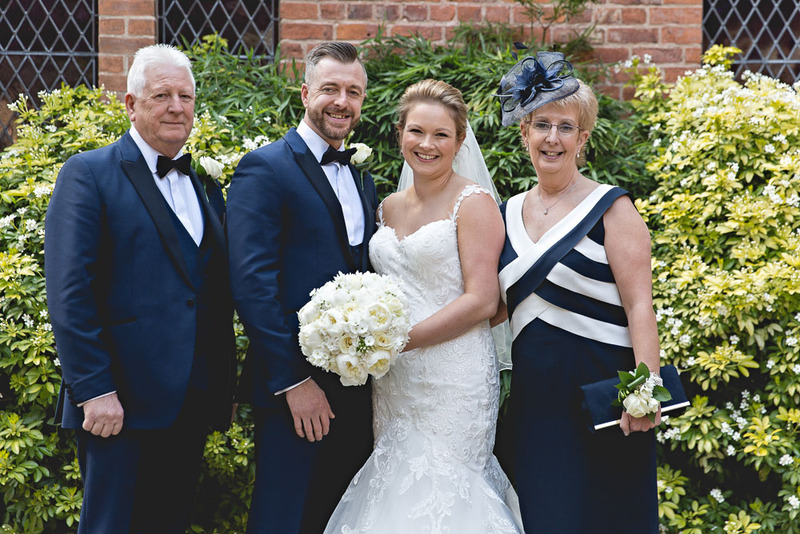 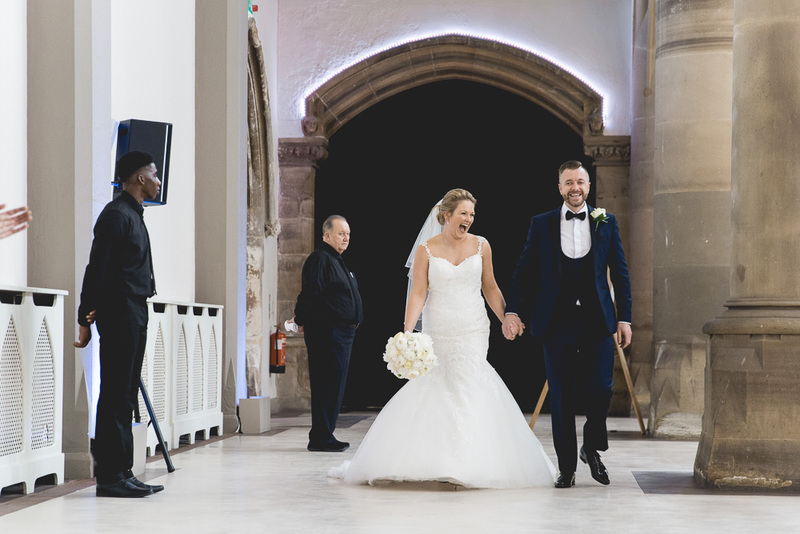 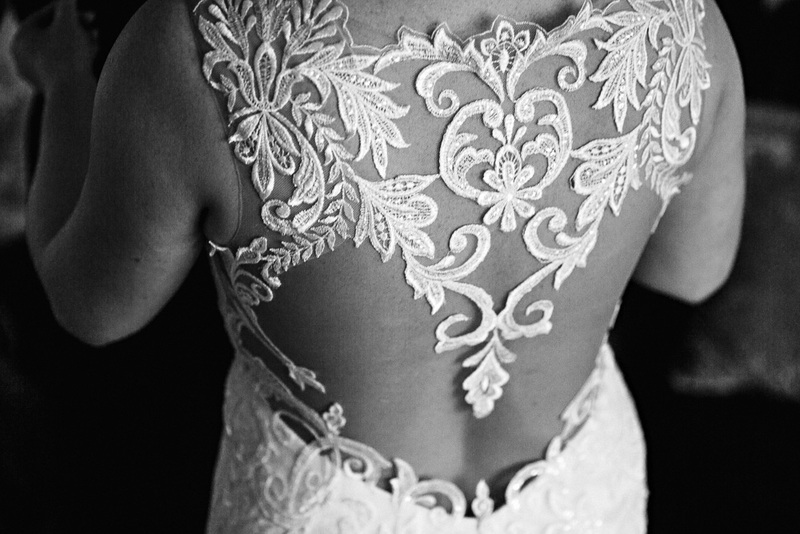 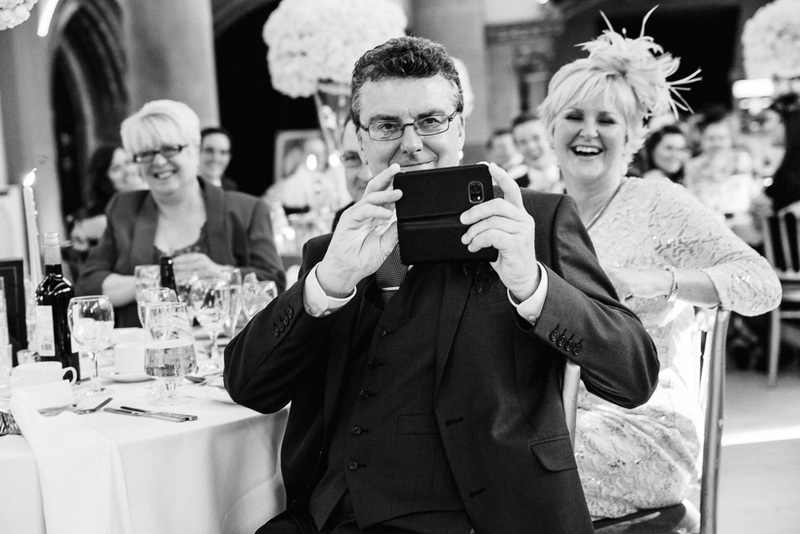 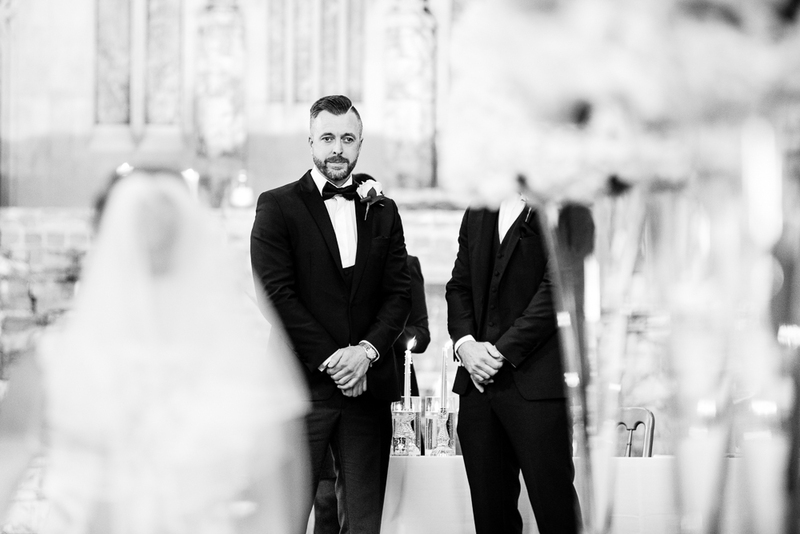 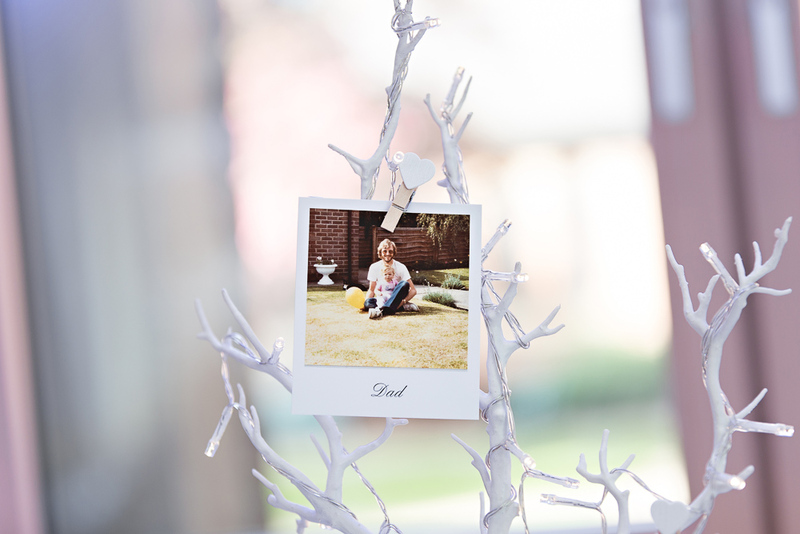 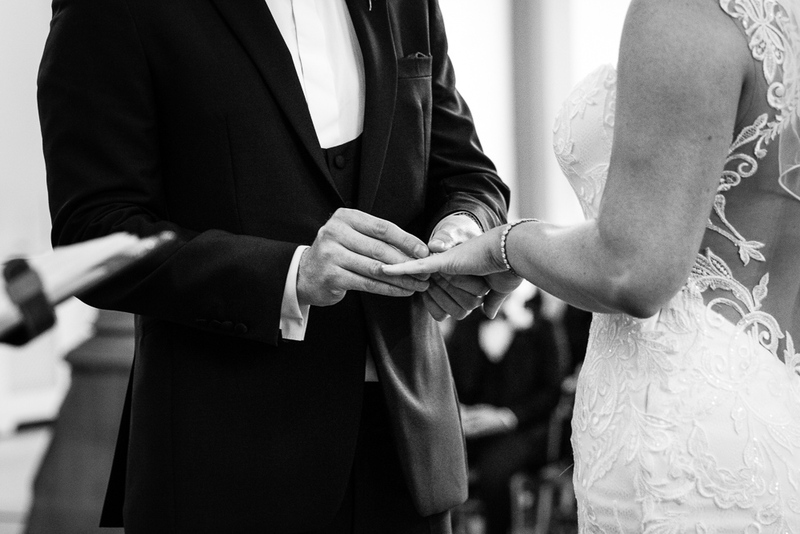 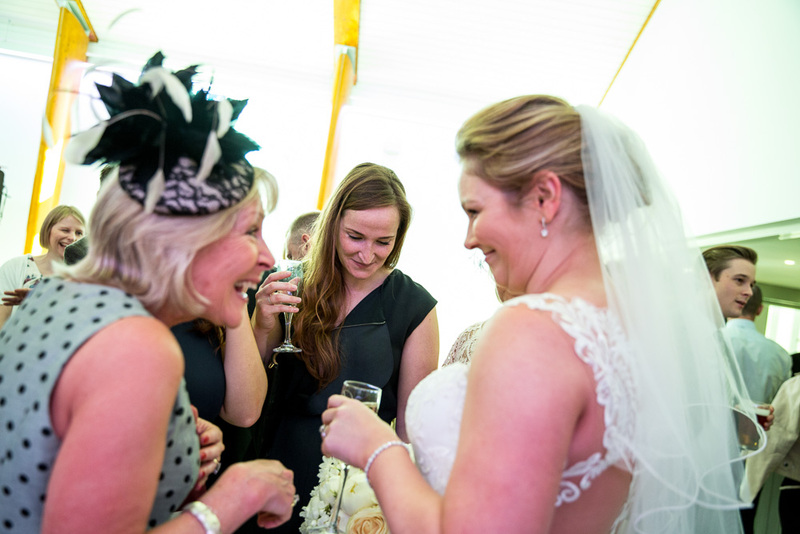 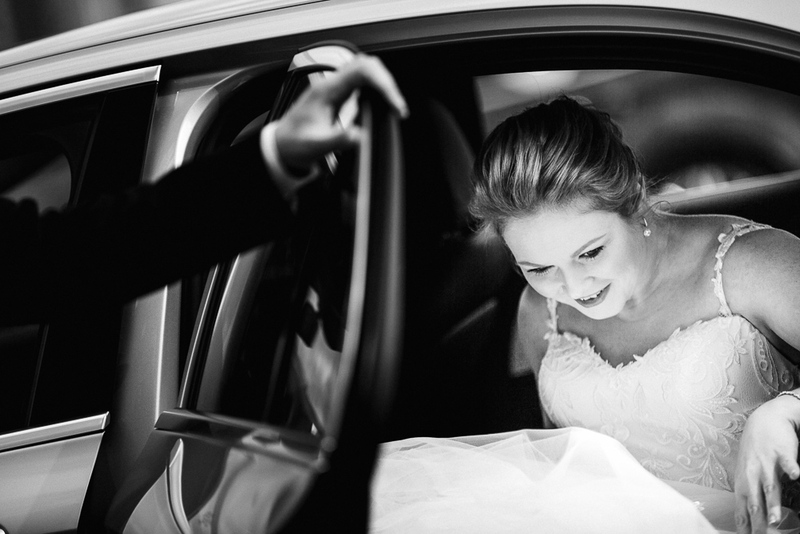 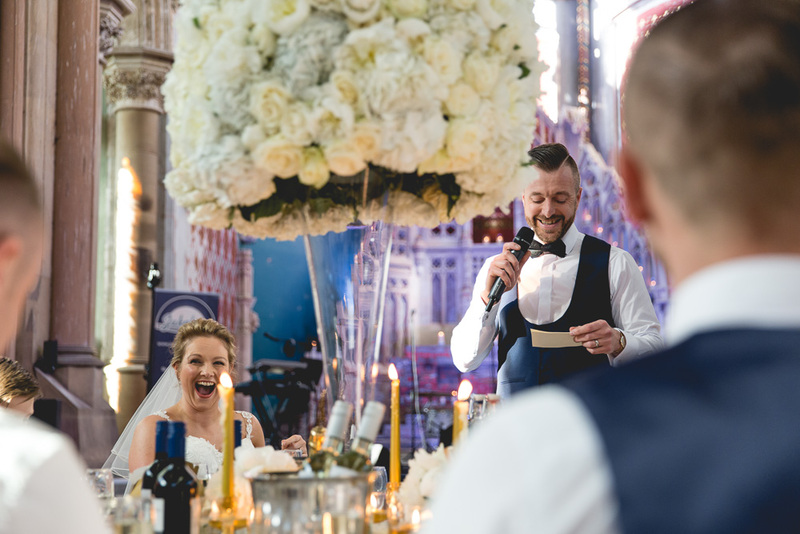 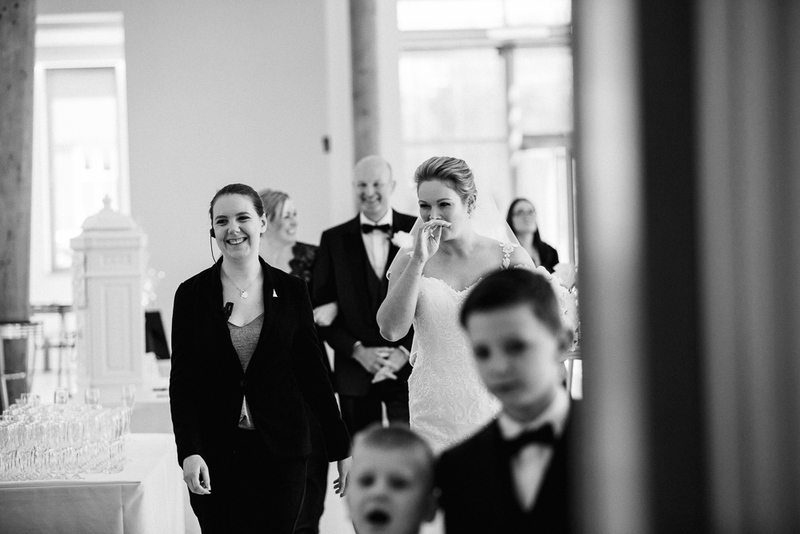 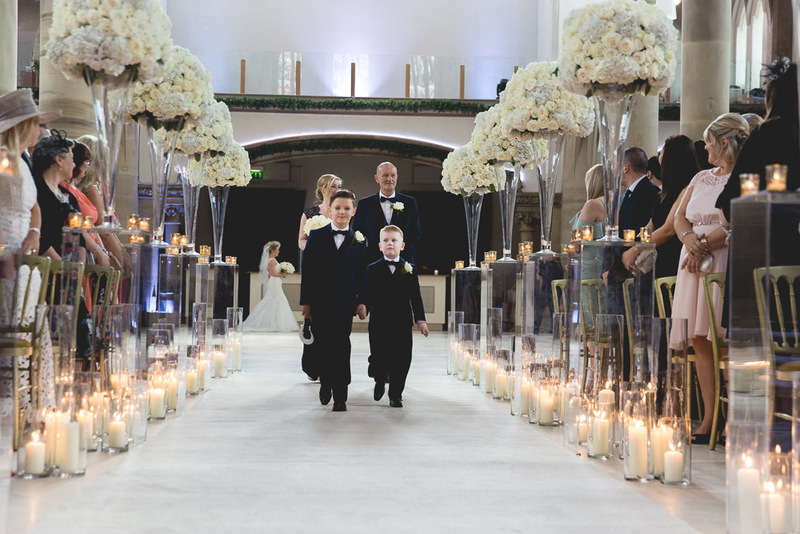 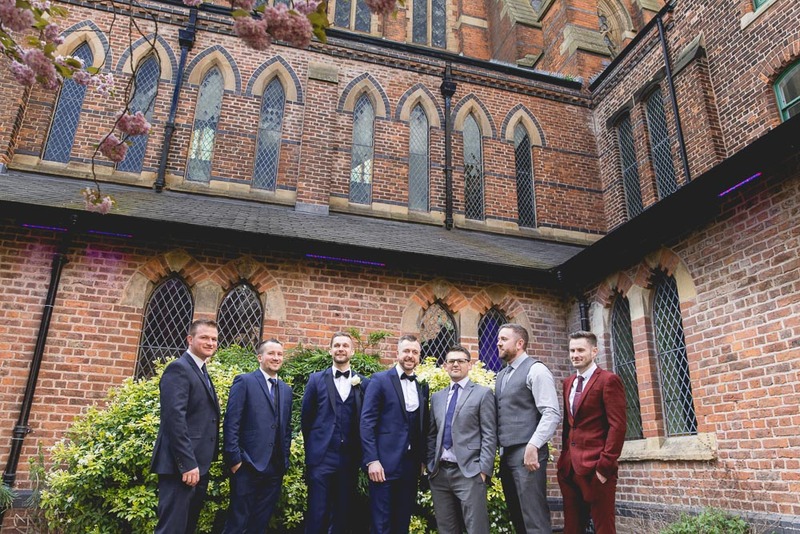 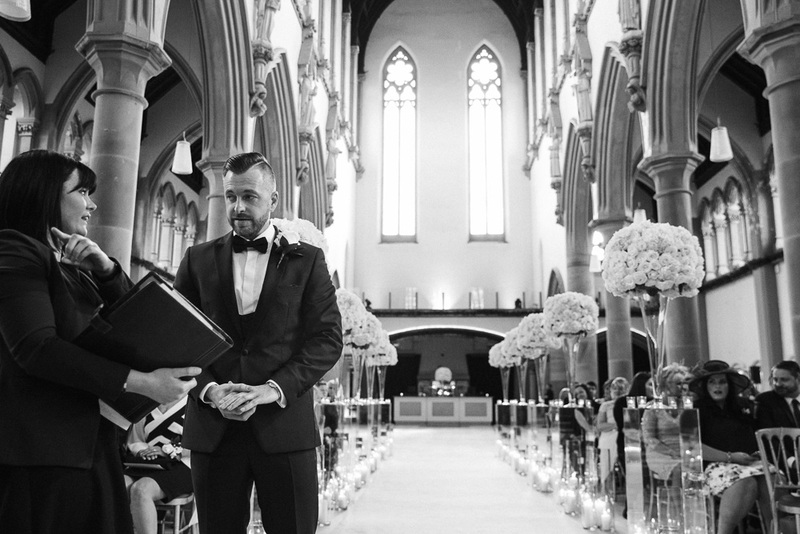 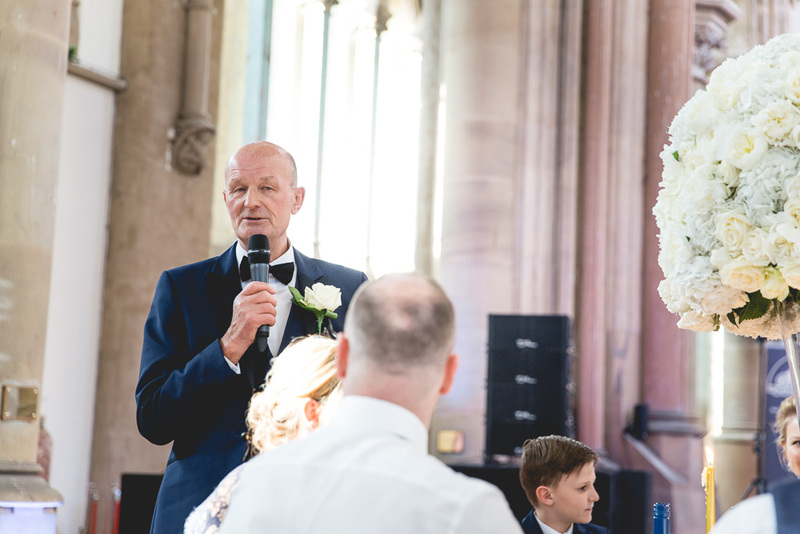 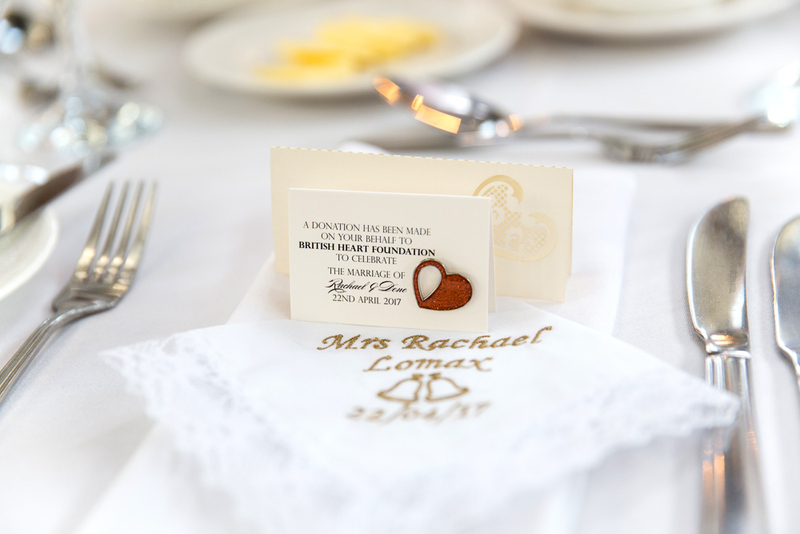 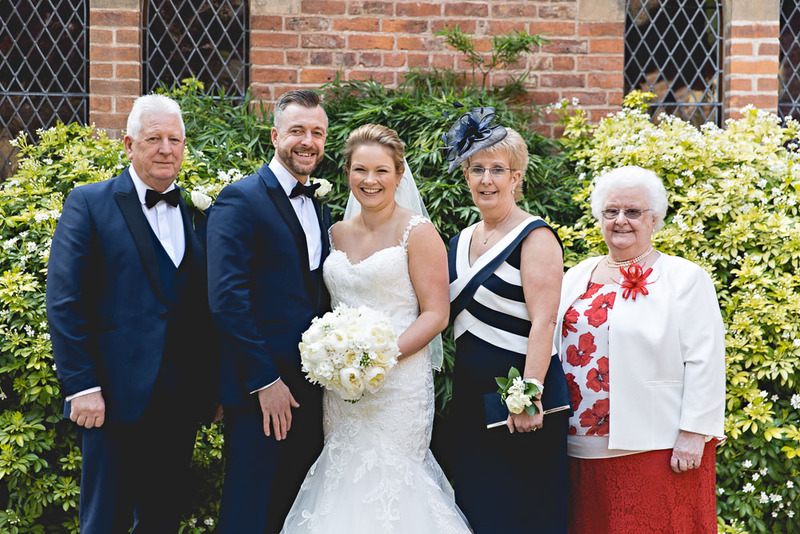 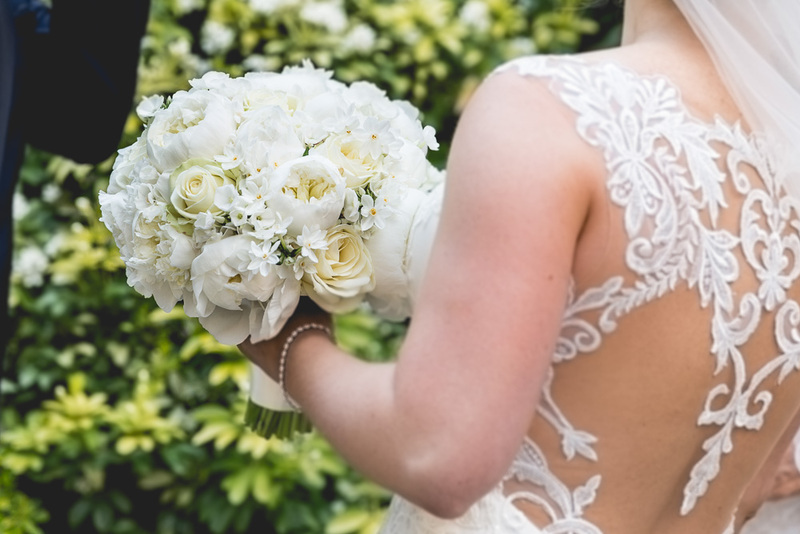 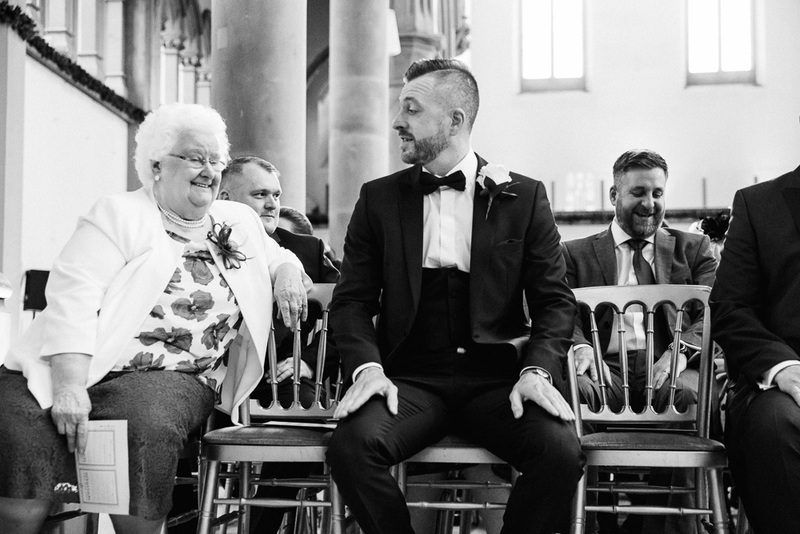 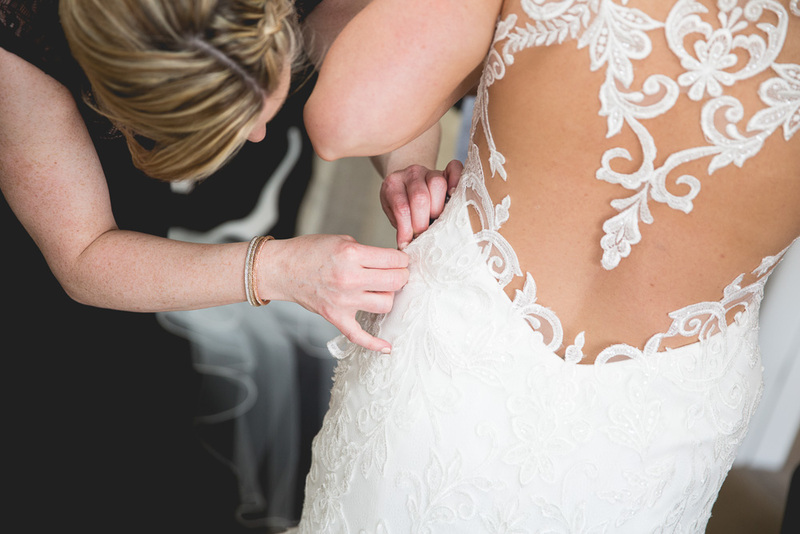 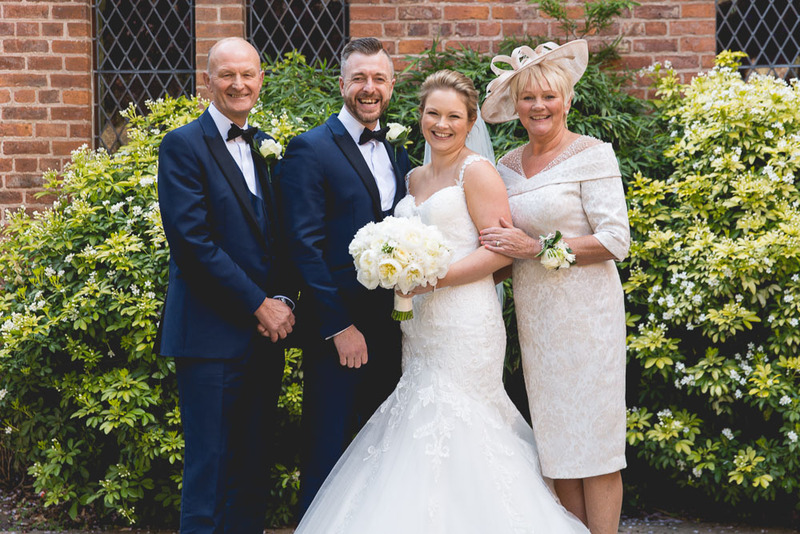 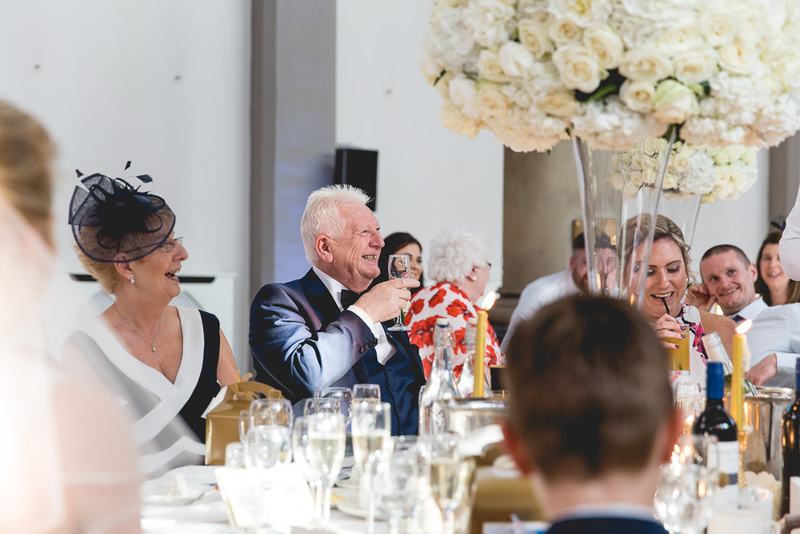 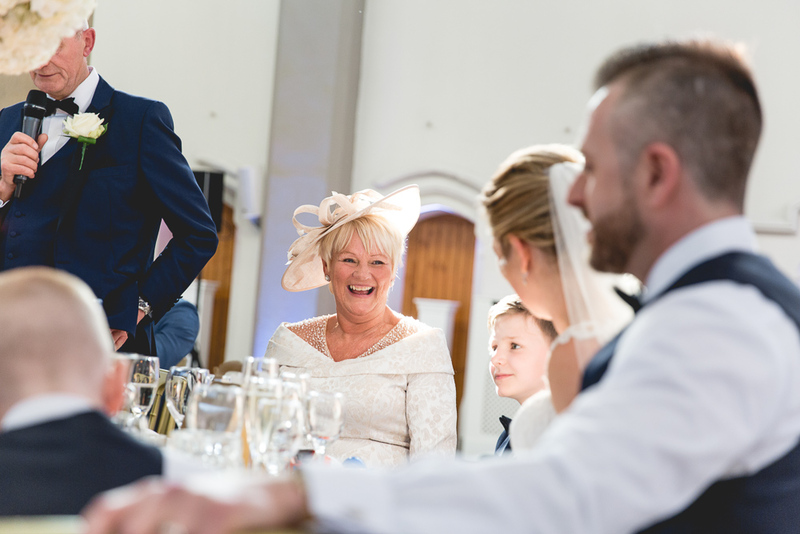 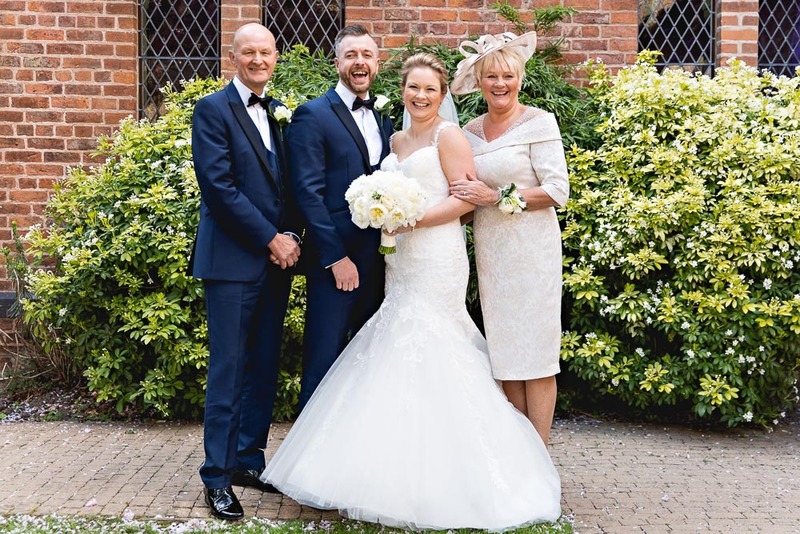 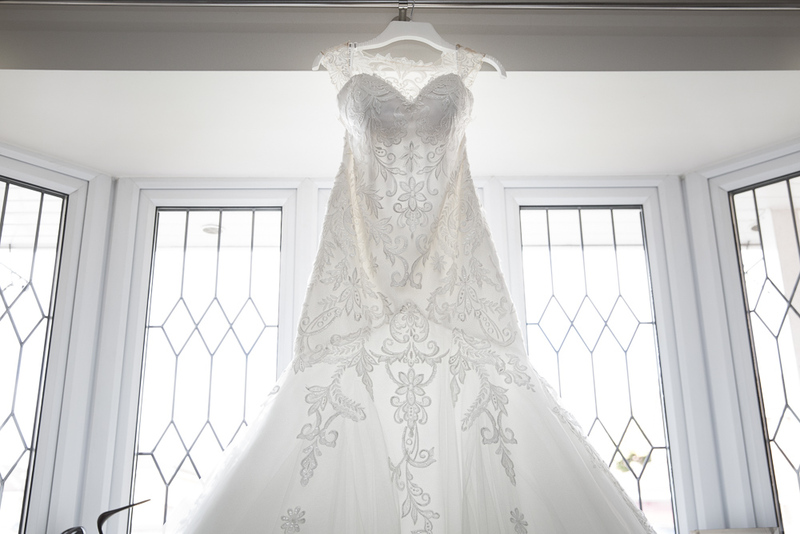 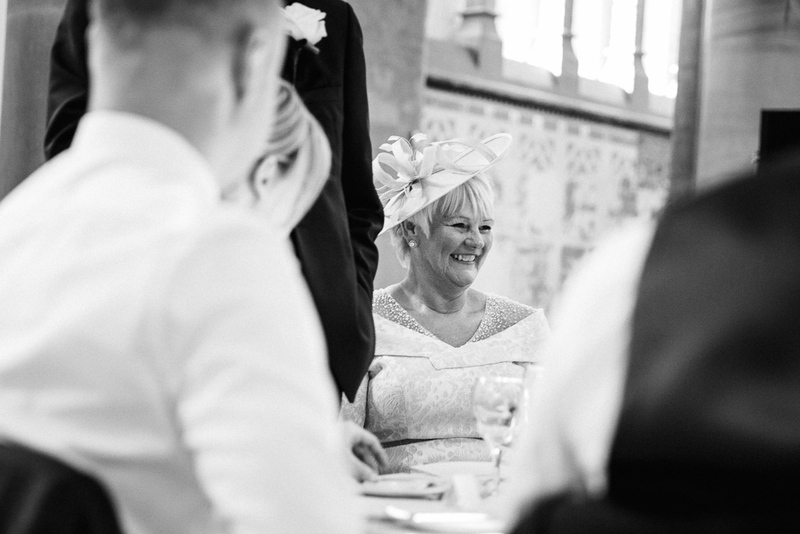 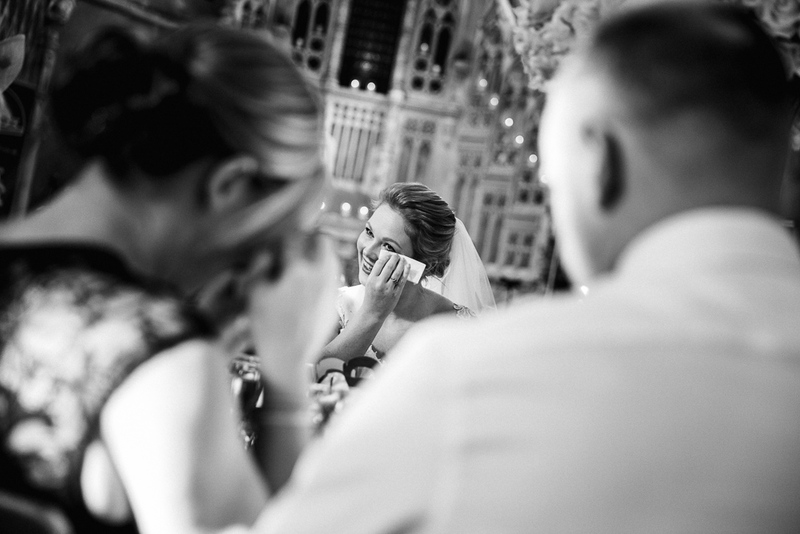 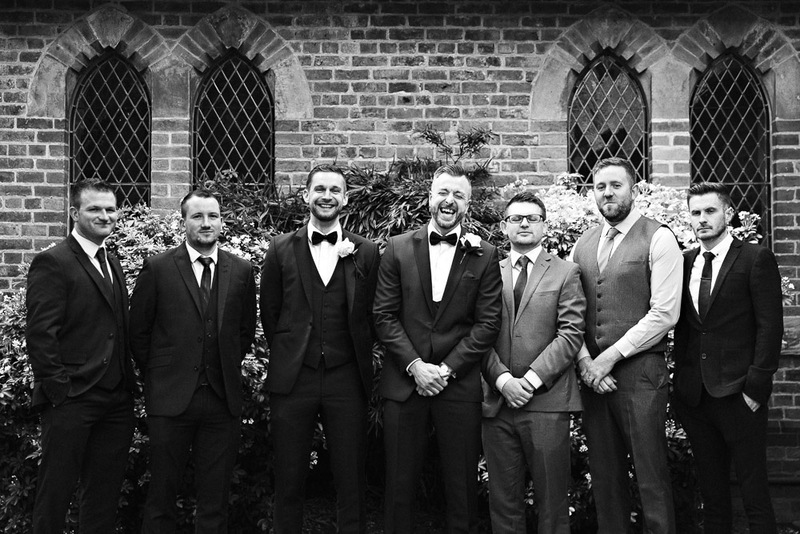 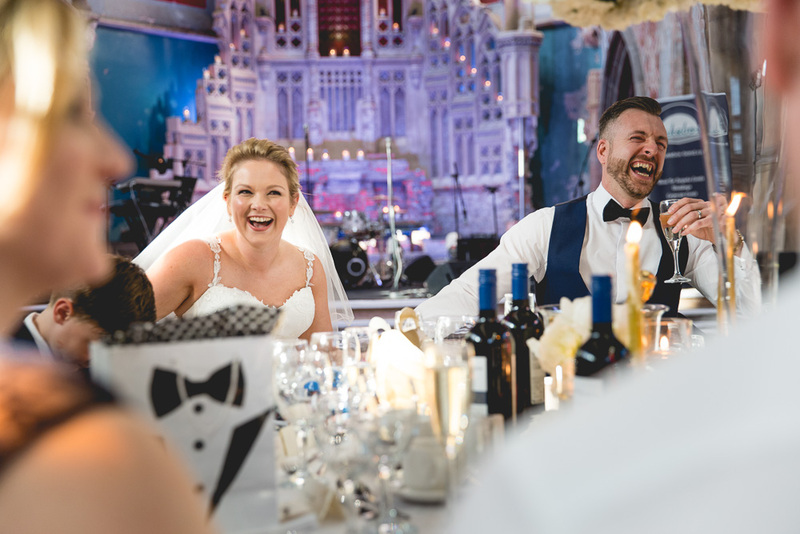 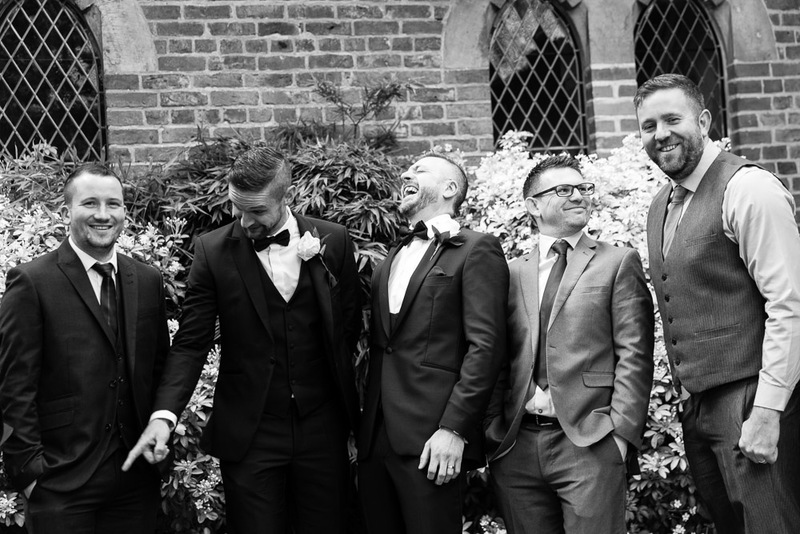 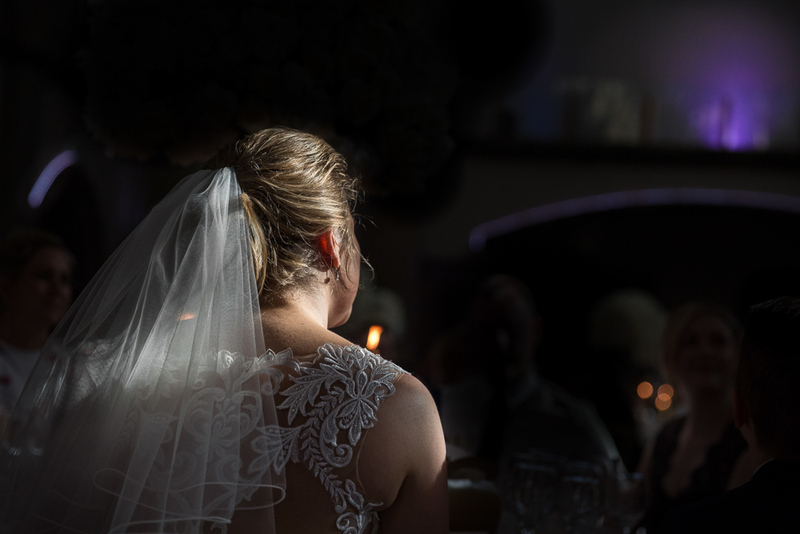 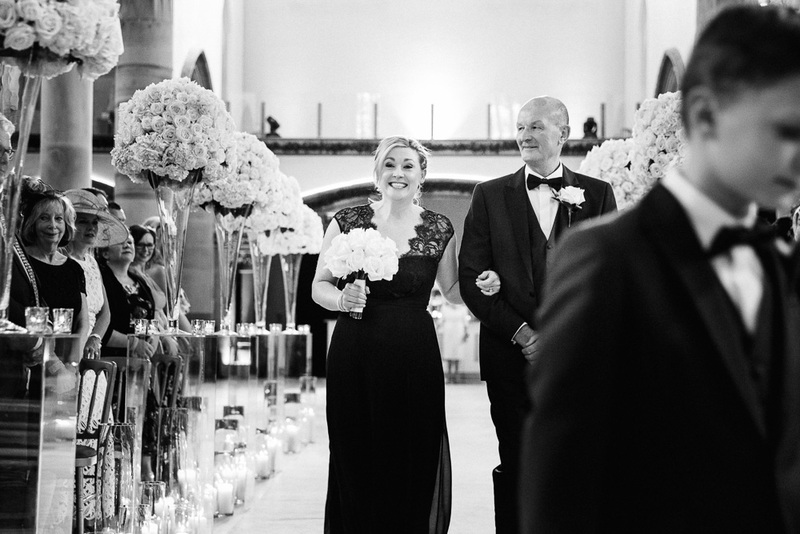 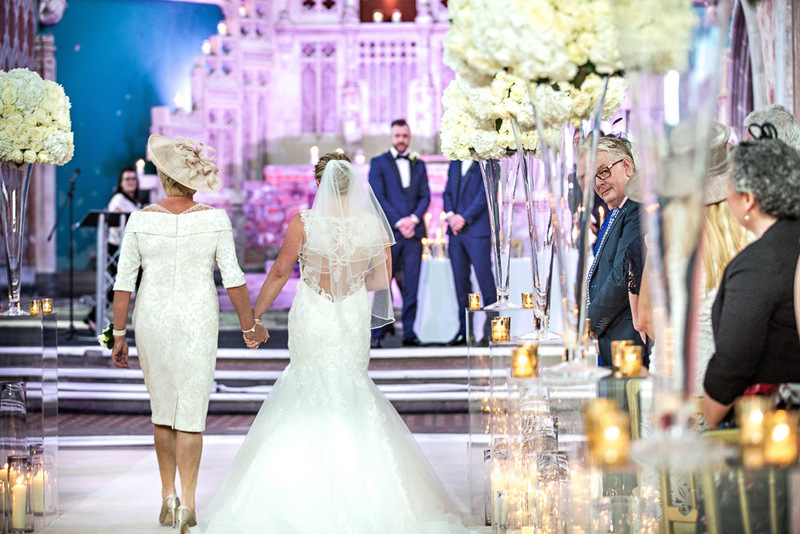 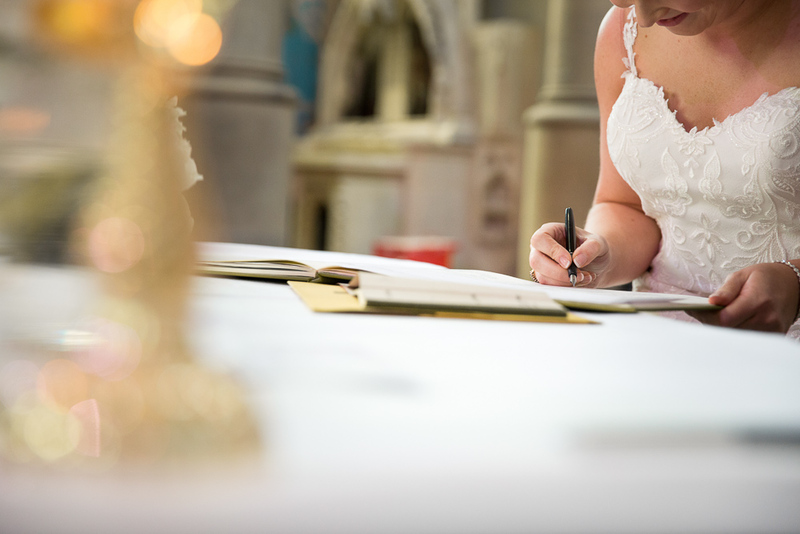 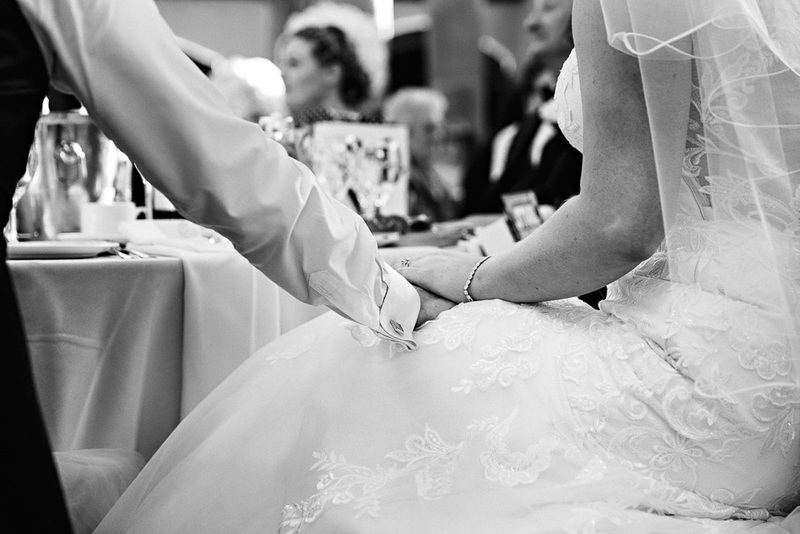 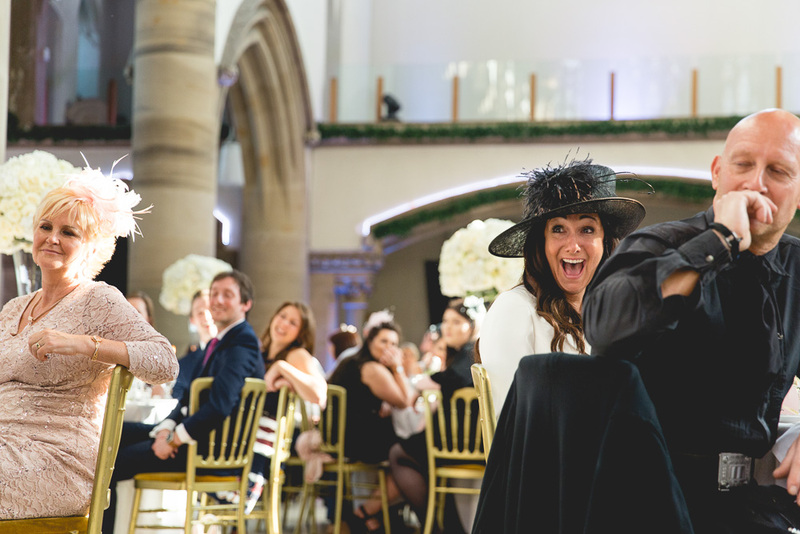 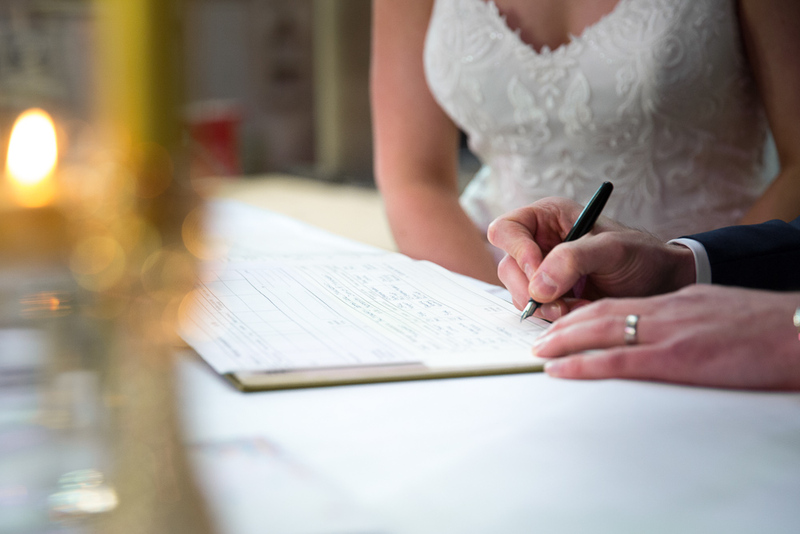 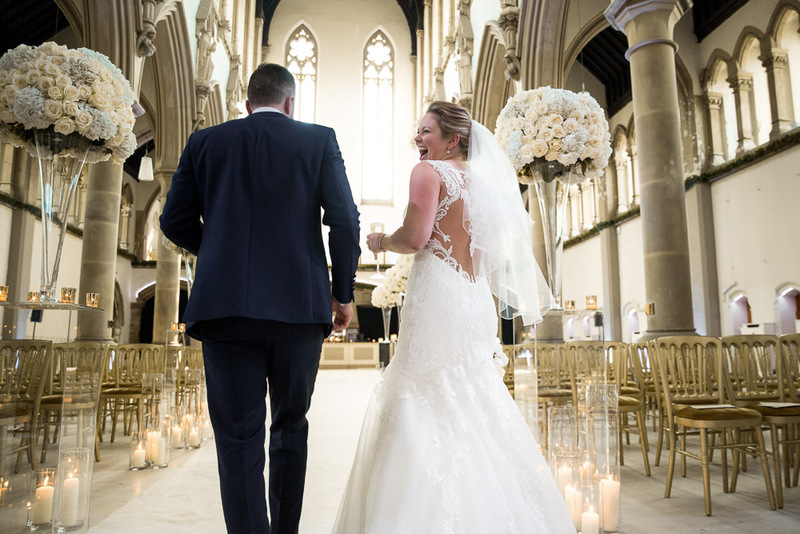 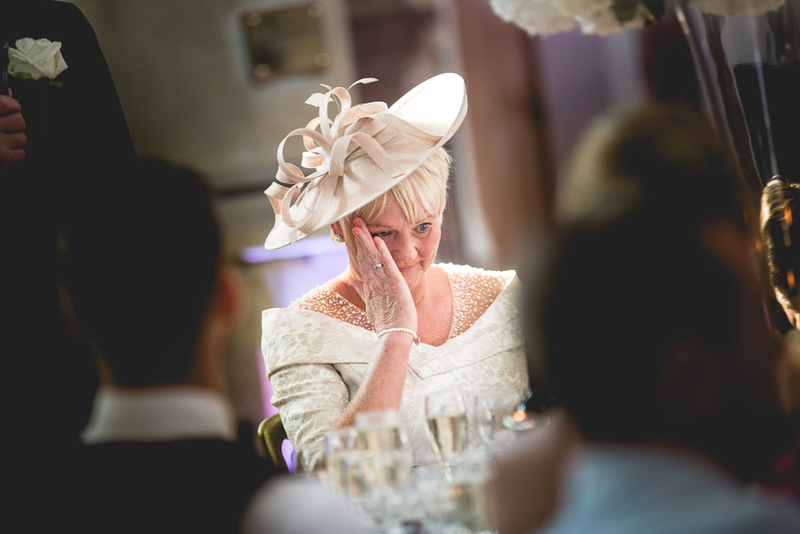 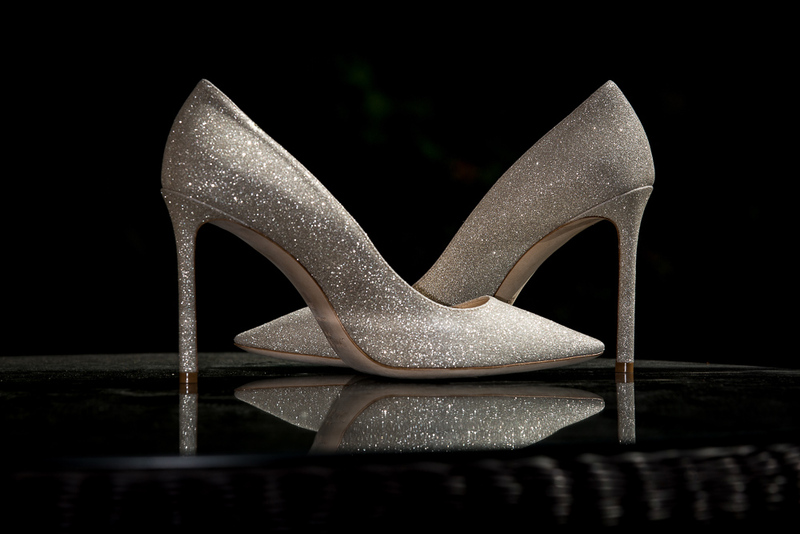 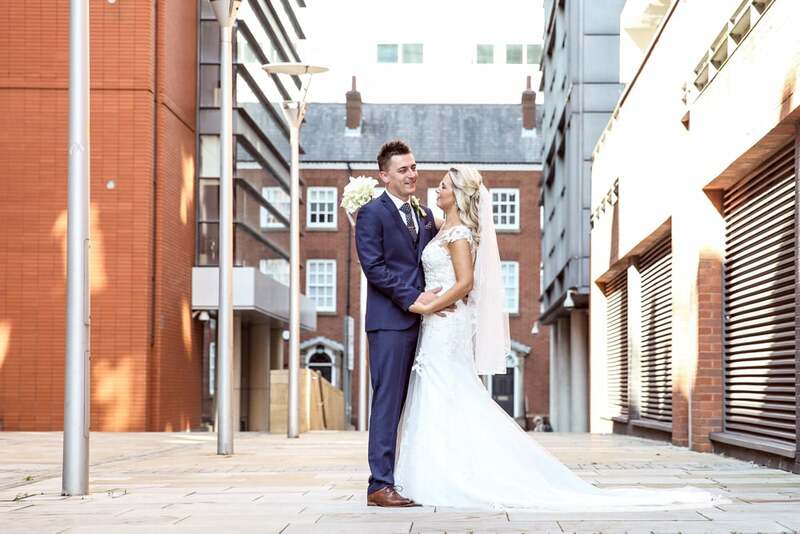 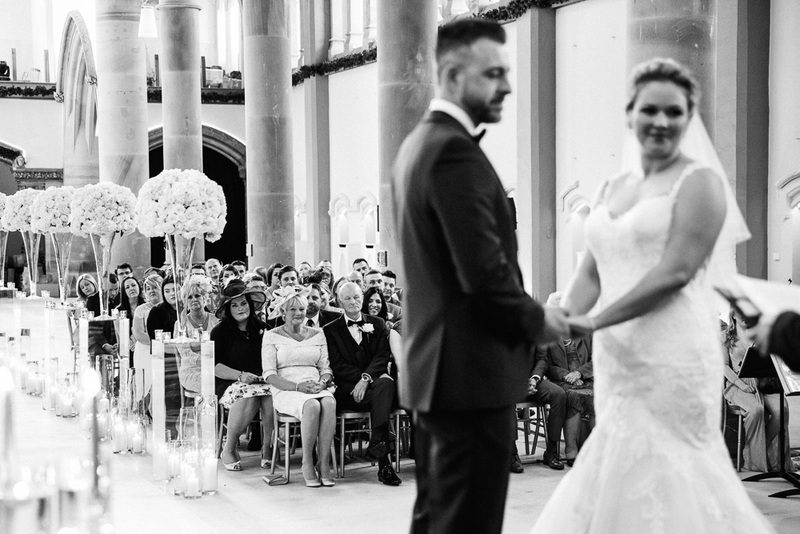 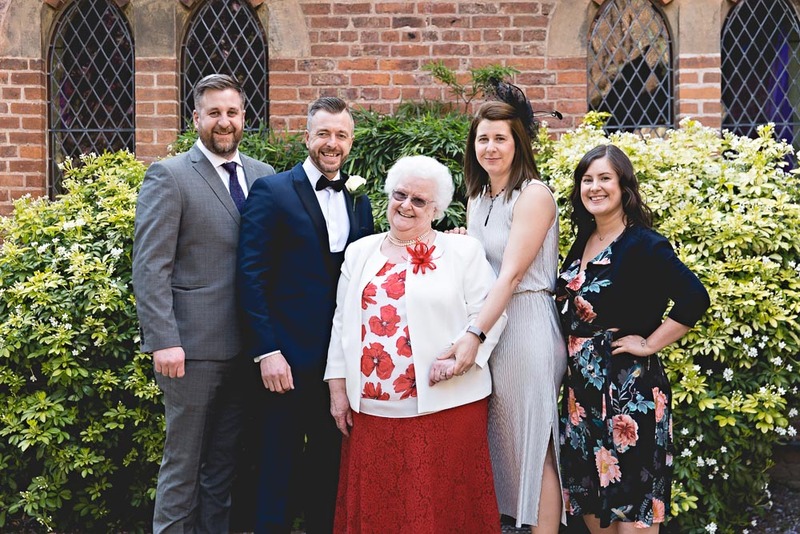 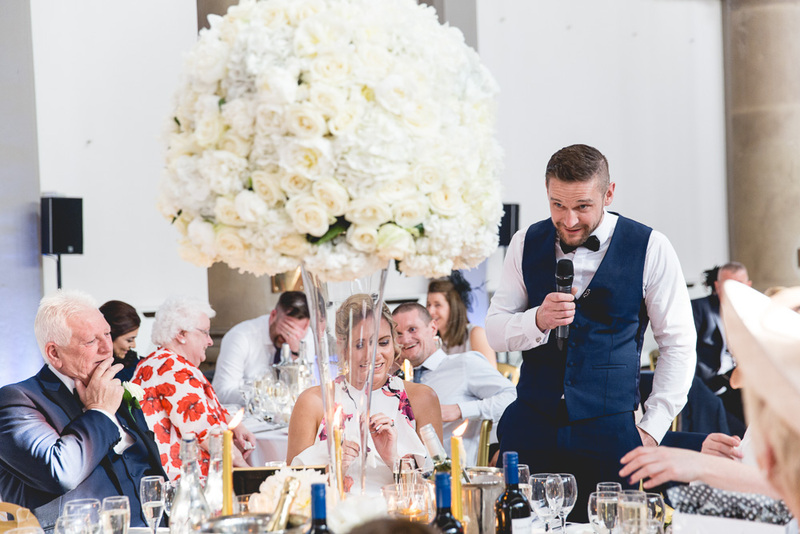 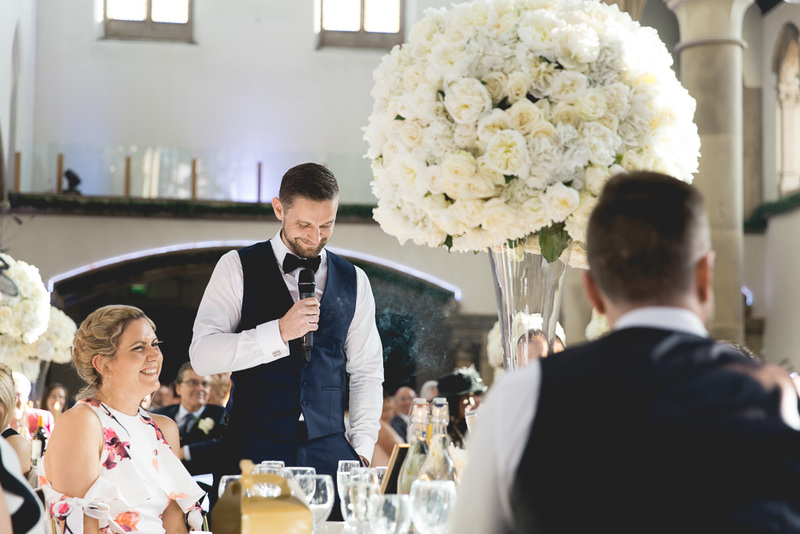 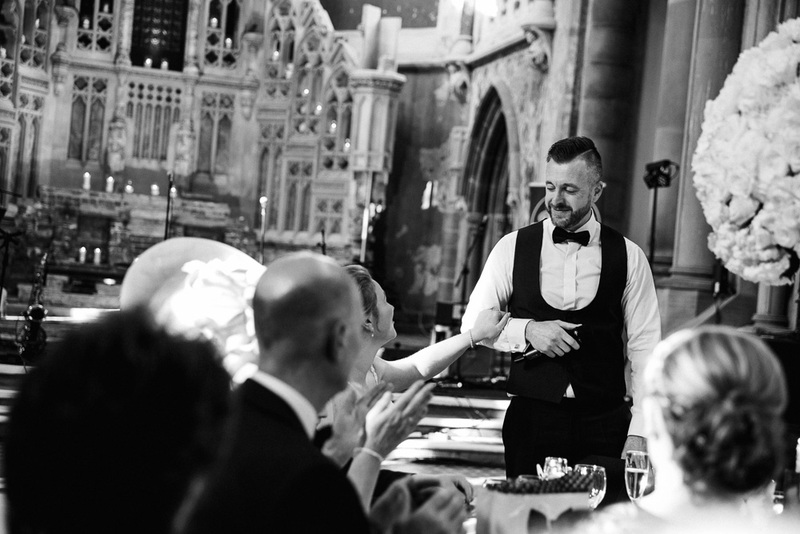 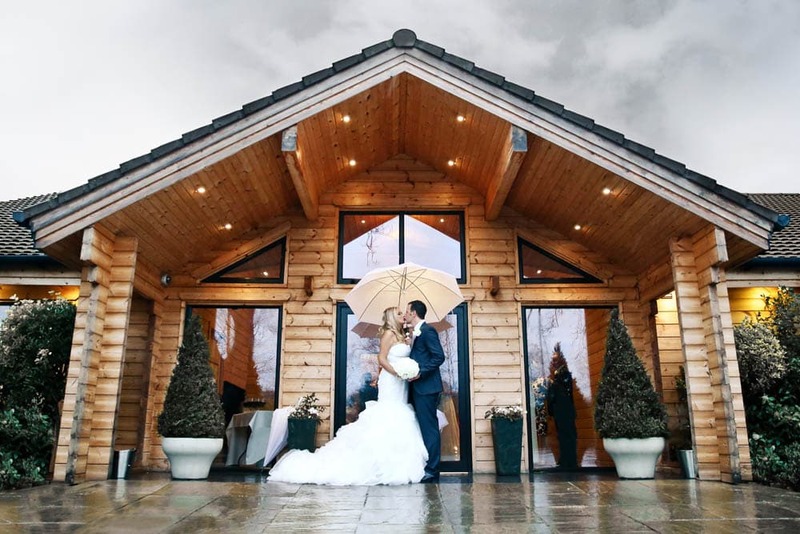 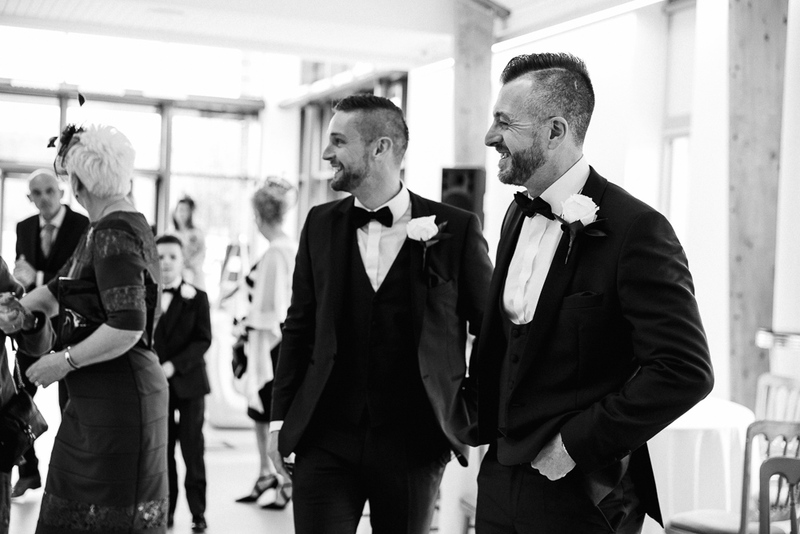 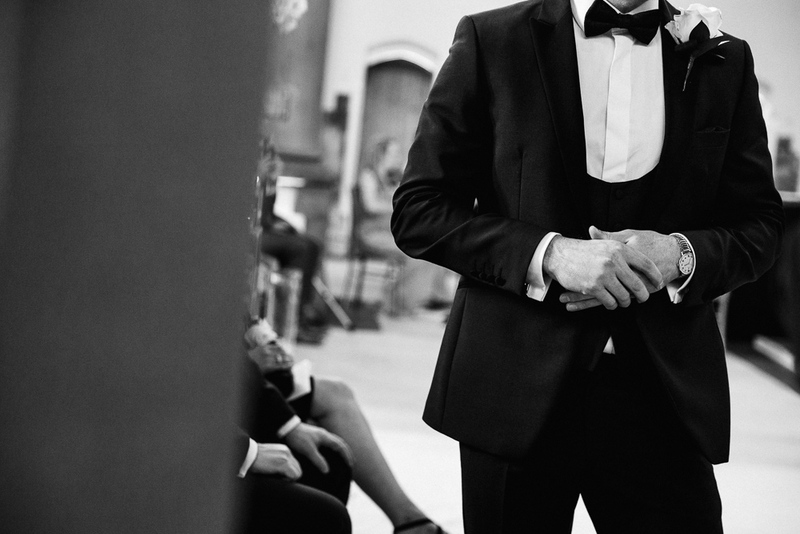 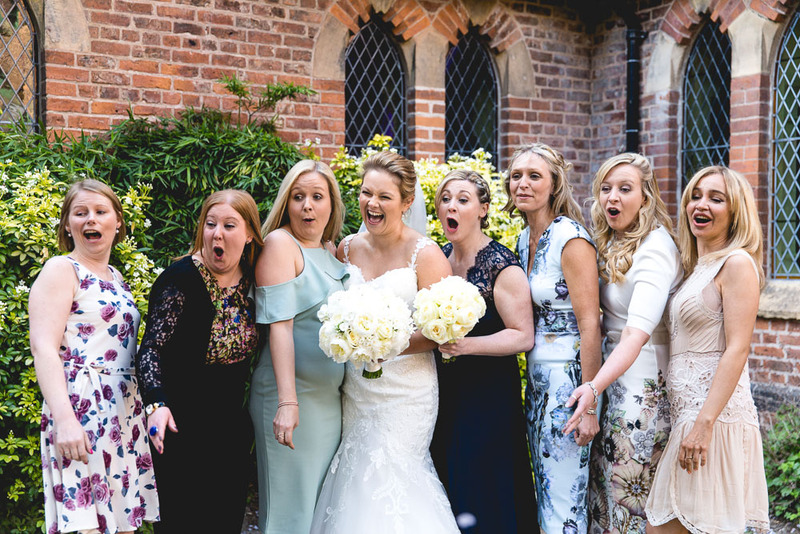 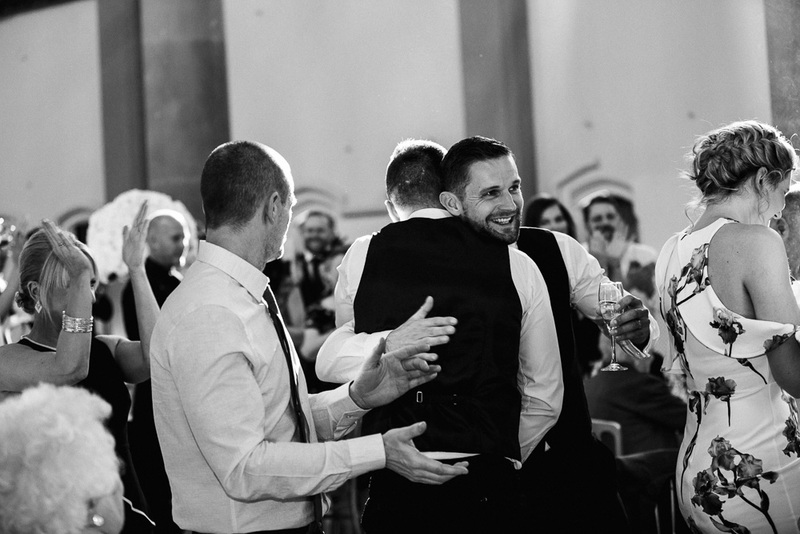 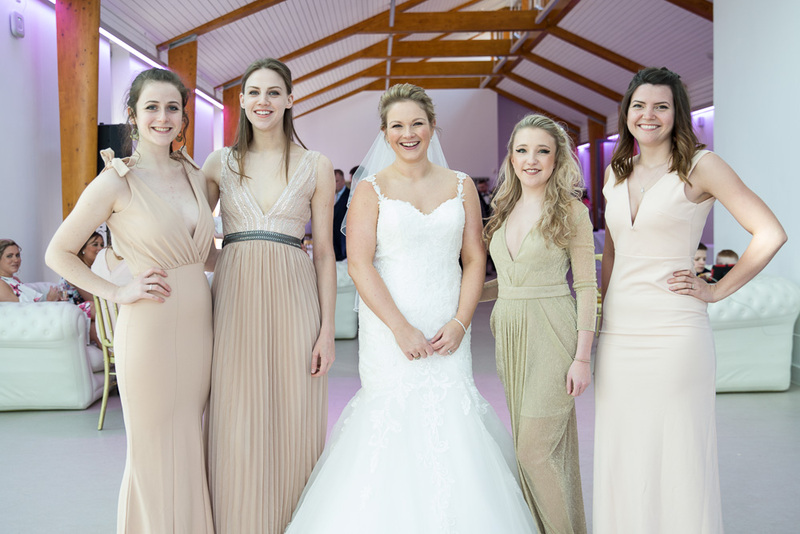 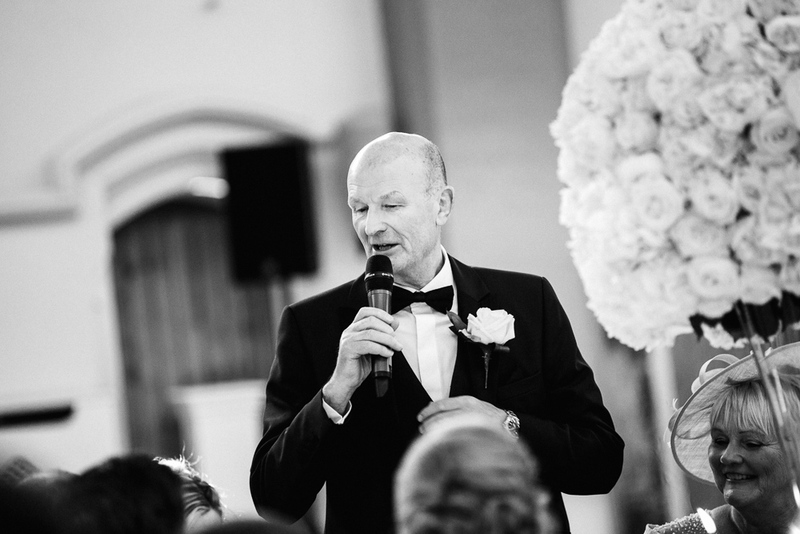 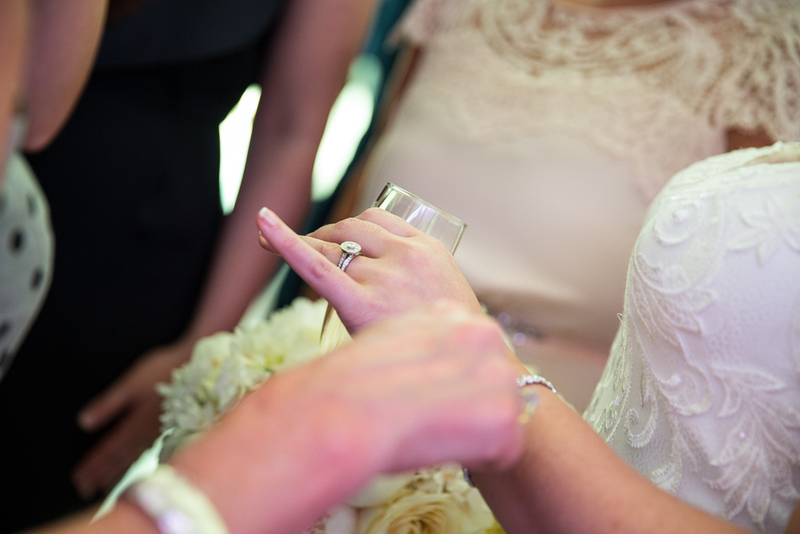 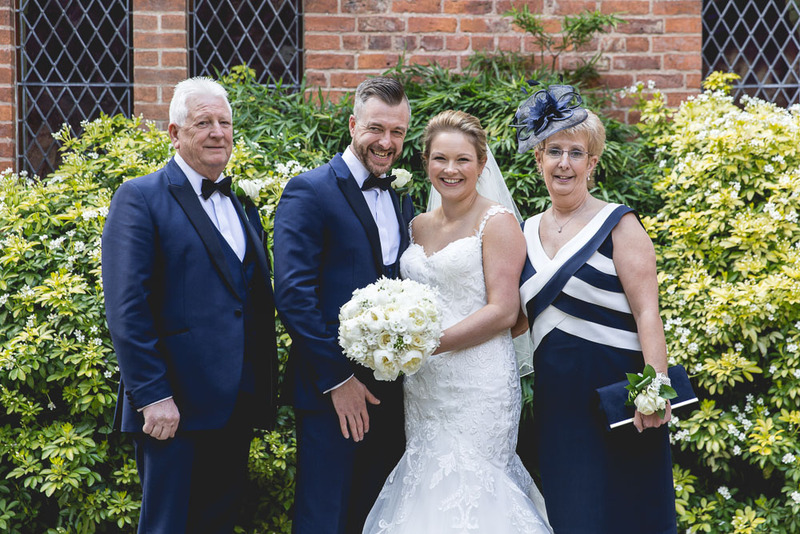 The venue staff are slick and the turnaround between the ceremony and wedding breakfast is timed to perfection, just leaving enough time for a drinks reception, mingling with your guests and photos. 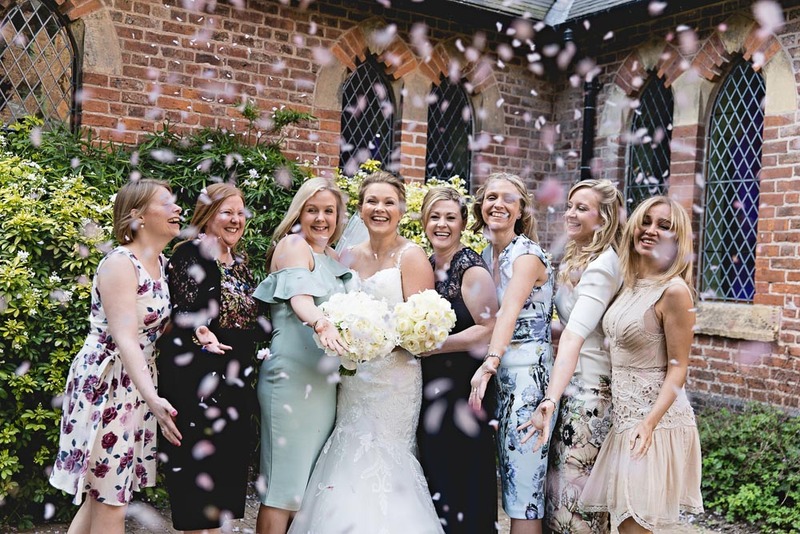 If you want confetti then make sure it is biodegradable as the venue don’t really like confetti left in the courtyard, another tip is to make sure that you choose a colour of uplight that fits your theme, the venue has up-lighters installed all over the place and the colour that looks the best is pink/purple but you can choose any colour you like.